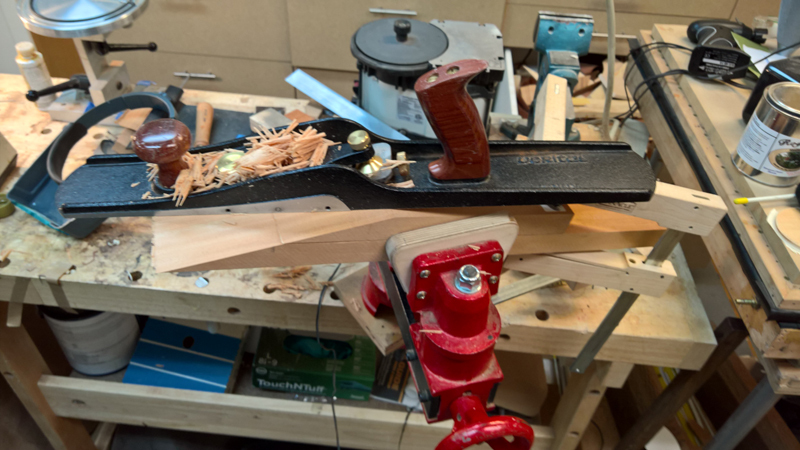 I am off to Japan for a couple of weeks so I will leave the project for a bit. 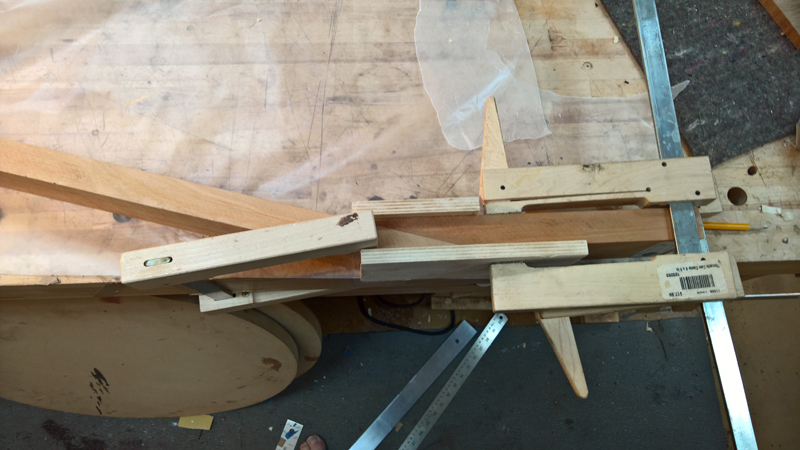 I did get the sides prepped, 30' Top, upper bout flattened and 15' back. 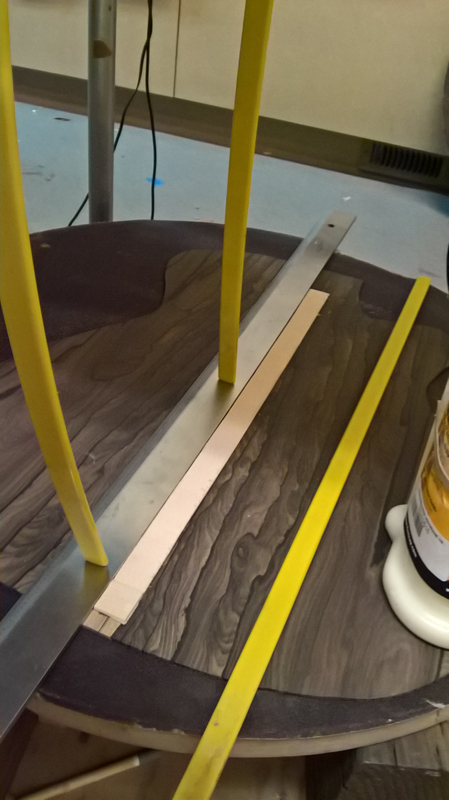 I used reverse kerfed linings and made and glued on my side mass mounts. 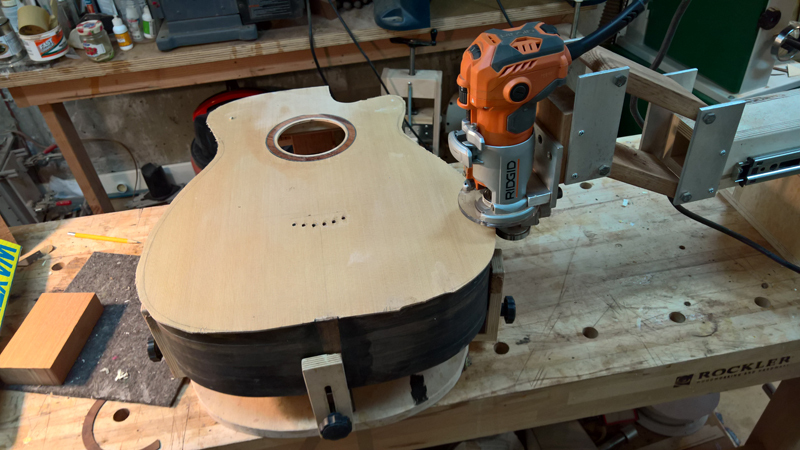 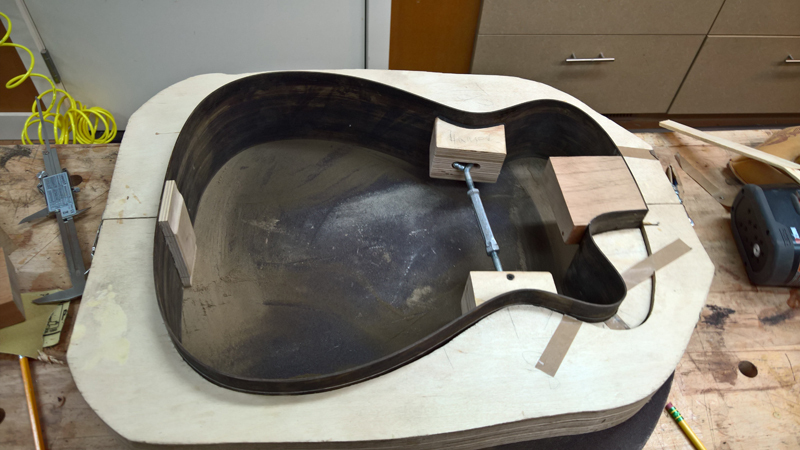 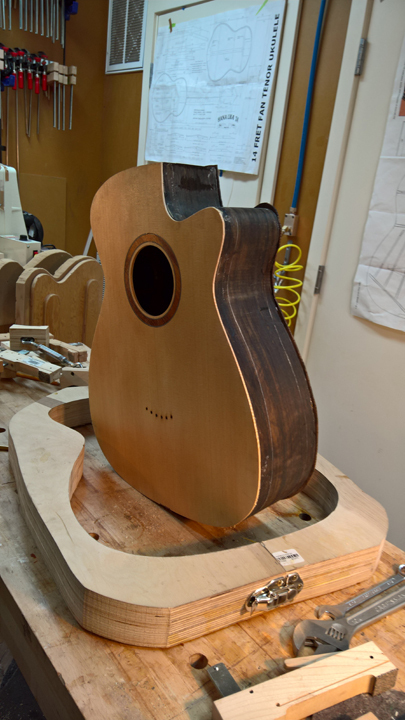 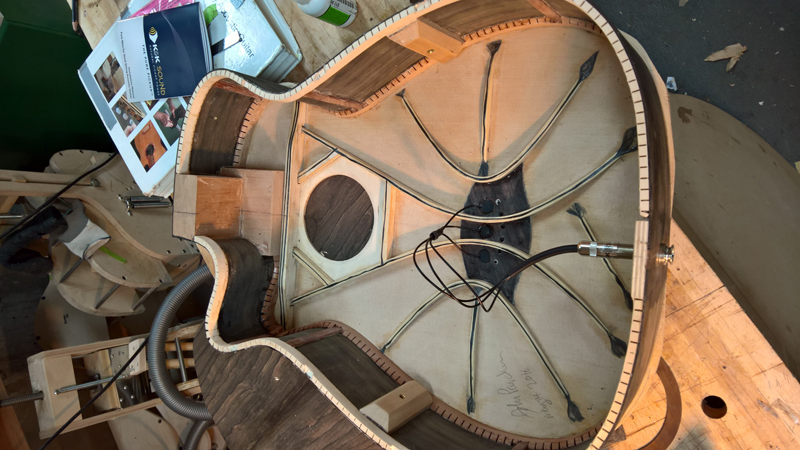 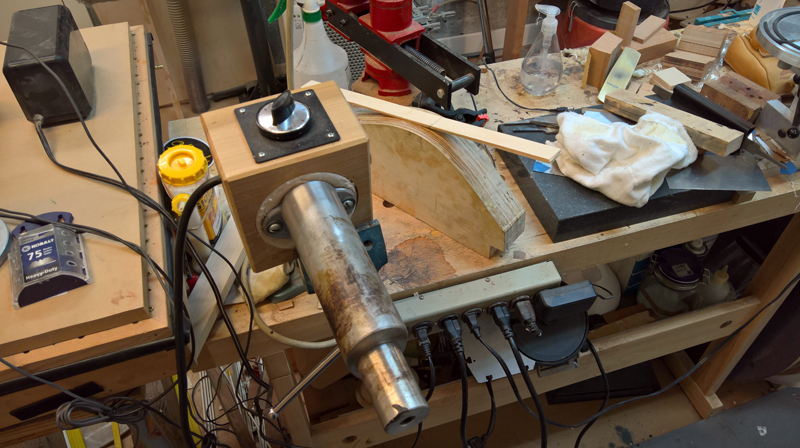 The side mass mounts allow me to lower the top resonance some after the guitar is assembled. 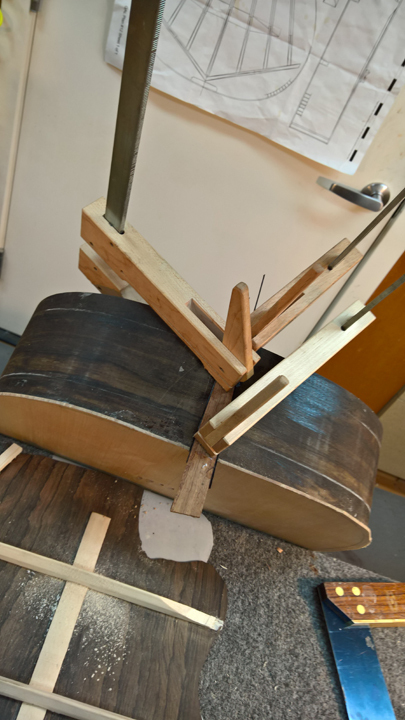 Adding mass to the sides in effect stiffens them to vibrations as seen by the top. 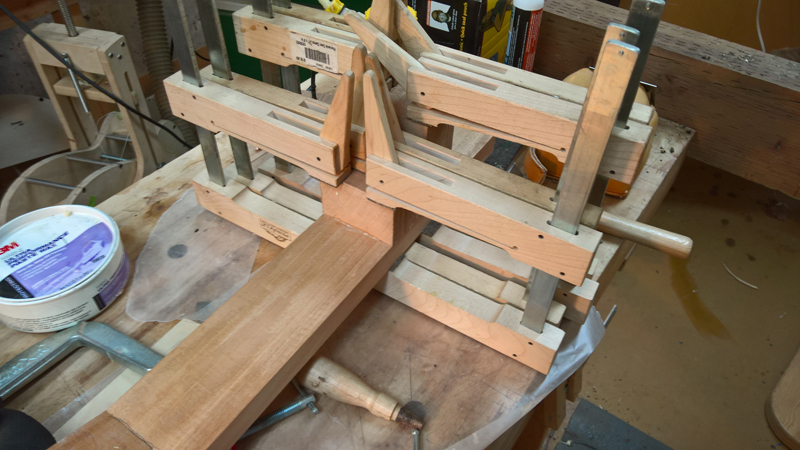 The mount for the side mass is just a bit of mahogany. 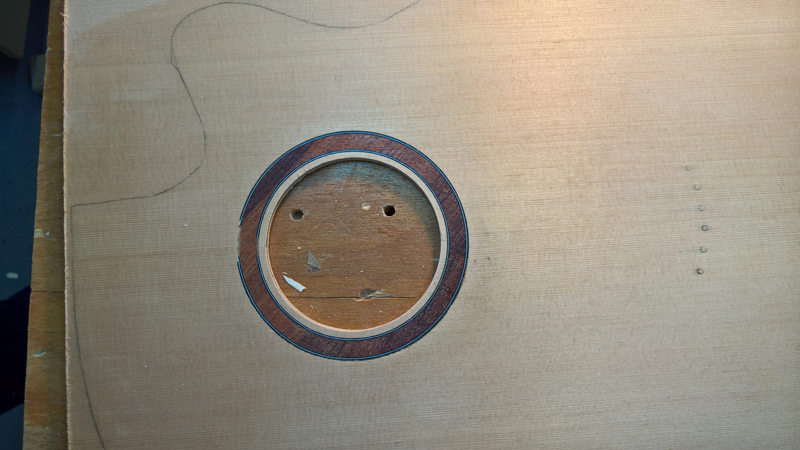 I drilled them just deep enough to seat the brass insert. 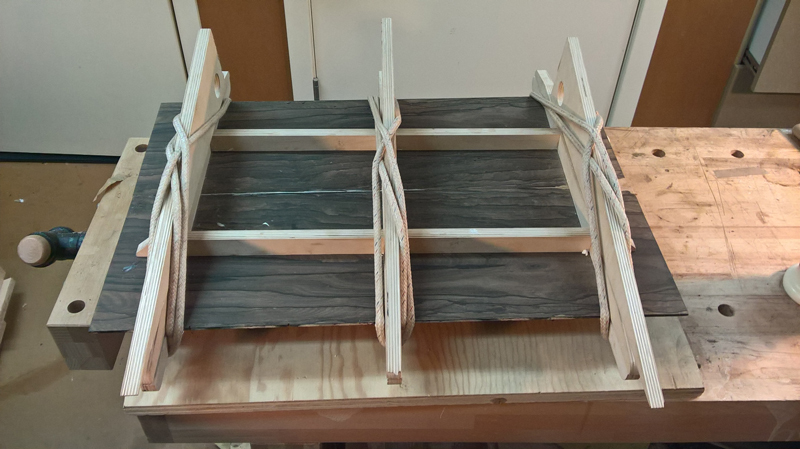 I nothced out the linings to fit them in. 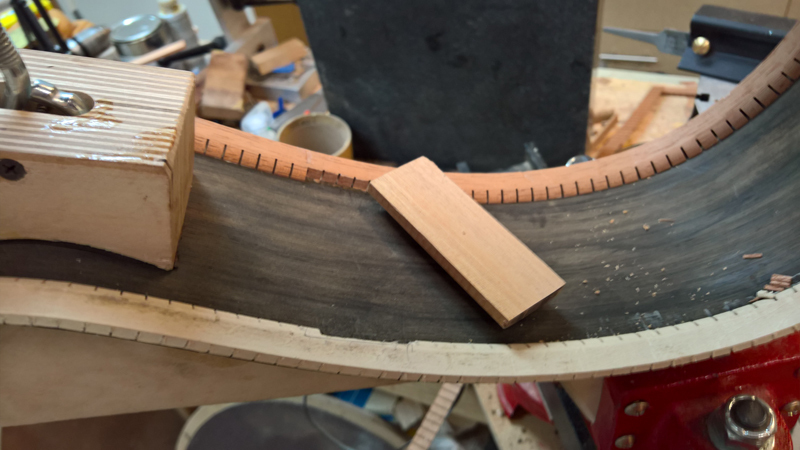 After a couple of weeks of touring around japan, I have started to make progress again. 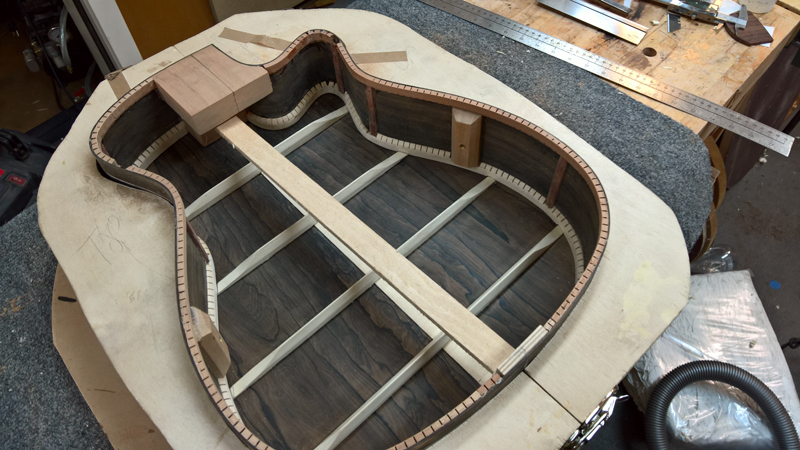 After a couple of weeks of touring around japan, I have started to make progress again. 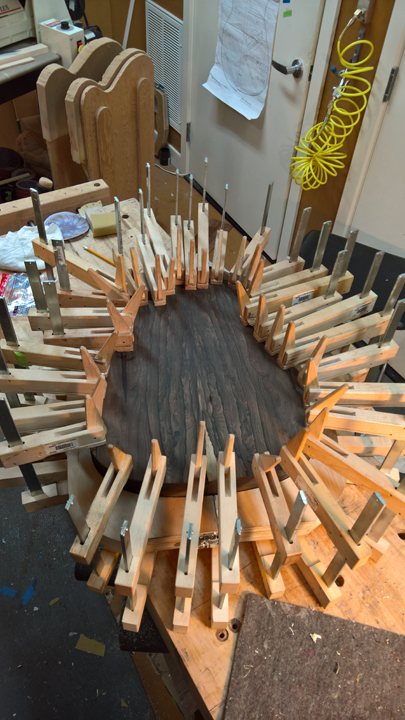 With the rims completed I turned my attention to the back and the top. 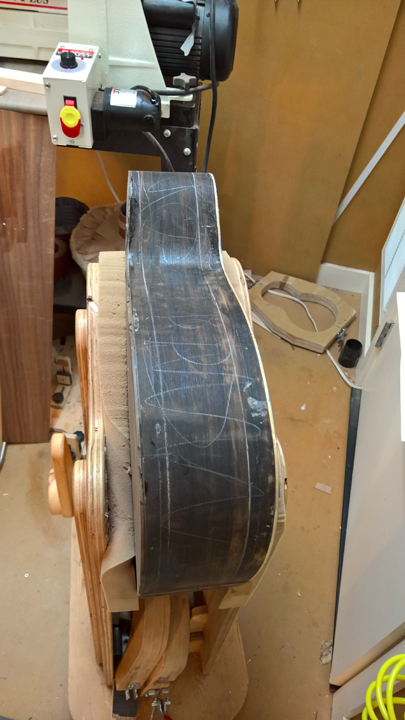 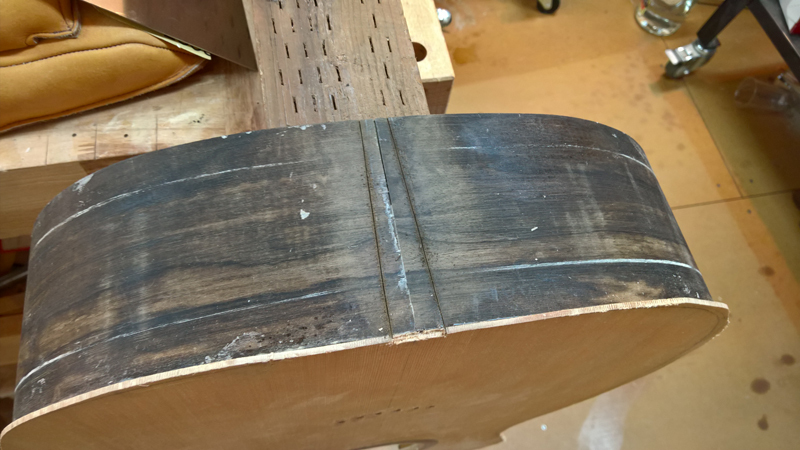 The back wood is really a bit too dense to have an active back so I made it with four lateral braces. 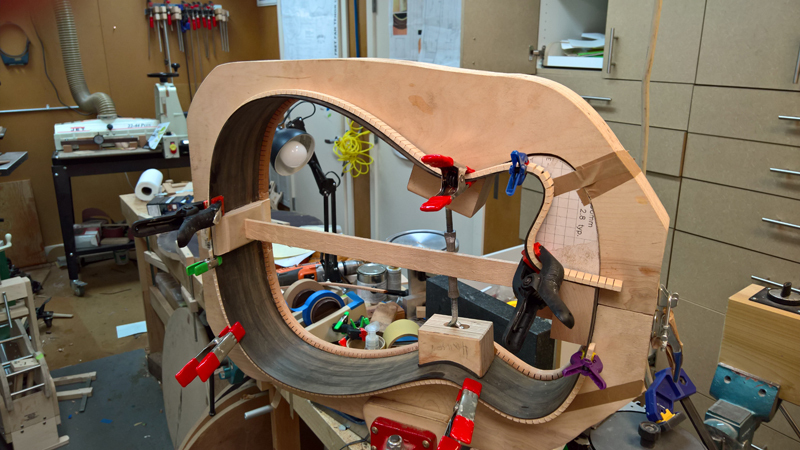 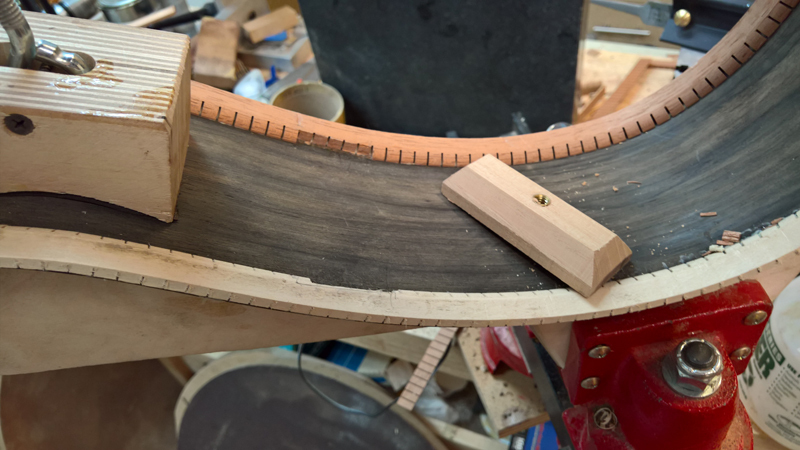 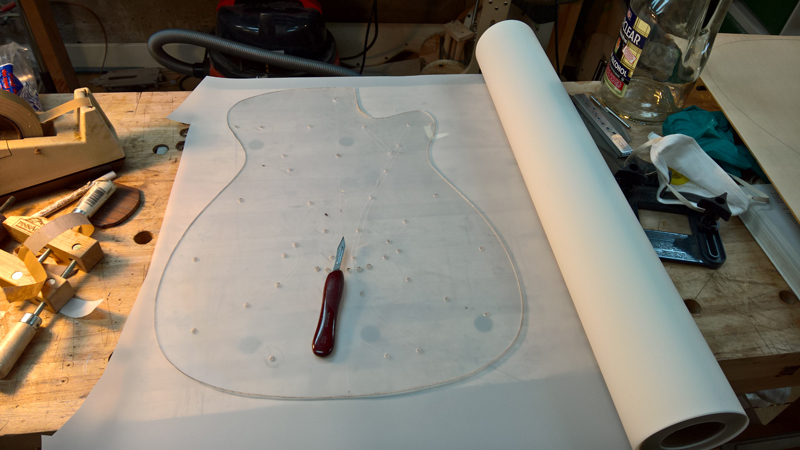 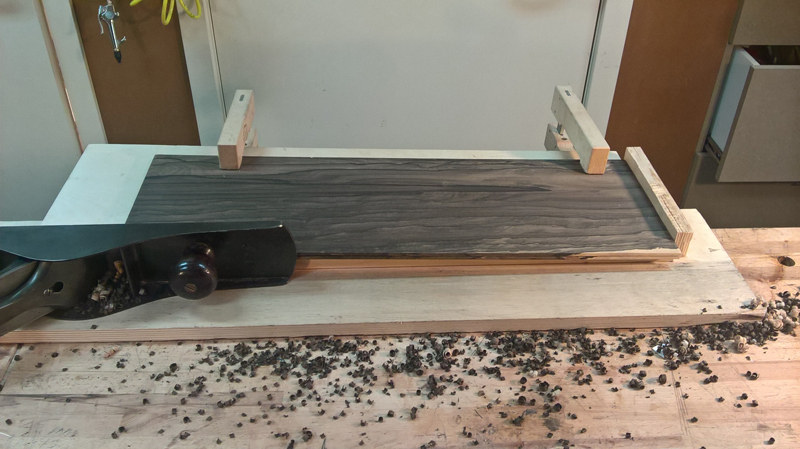 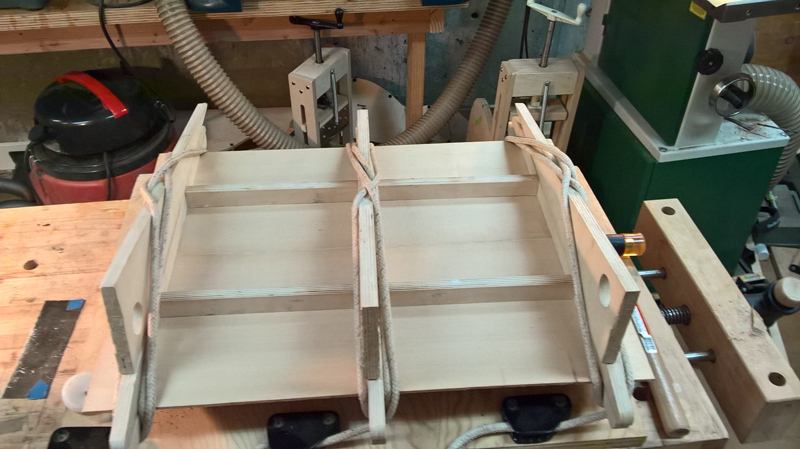 Having built a series of jigs for my falcate guitars and fine tuning them making and shaping the braces is turning out to go a bit smoother than in the past. 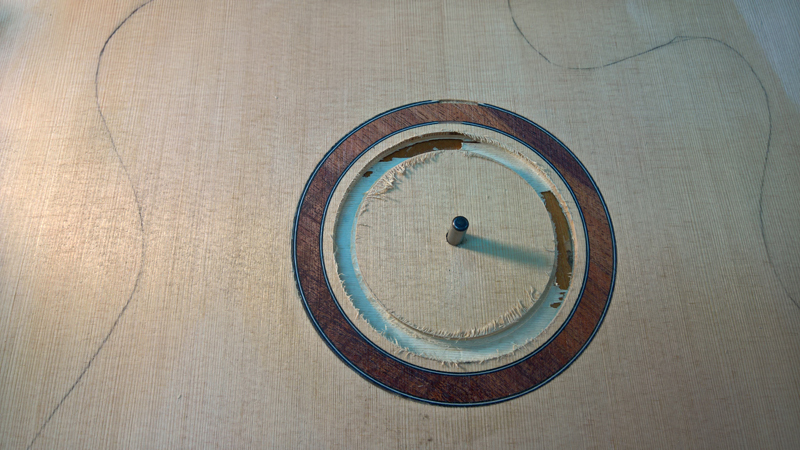 I jointed the top and and installed the rosette. 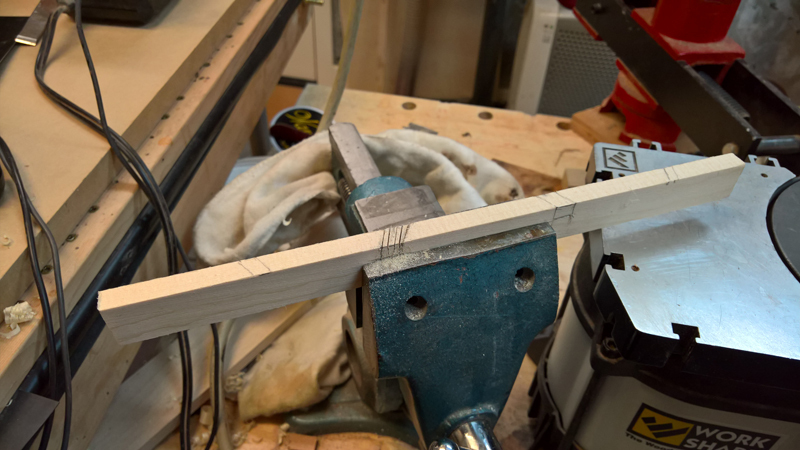 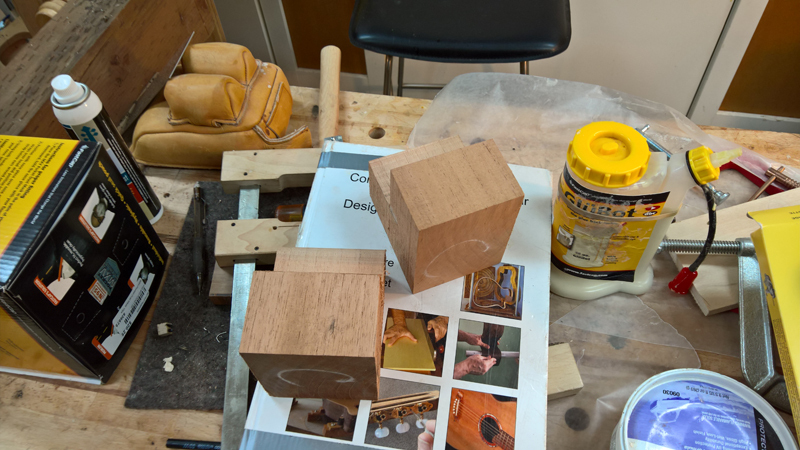 On the rosette I start with a router bit the same size as the purfling strip I use. 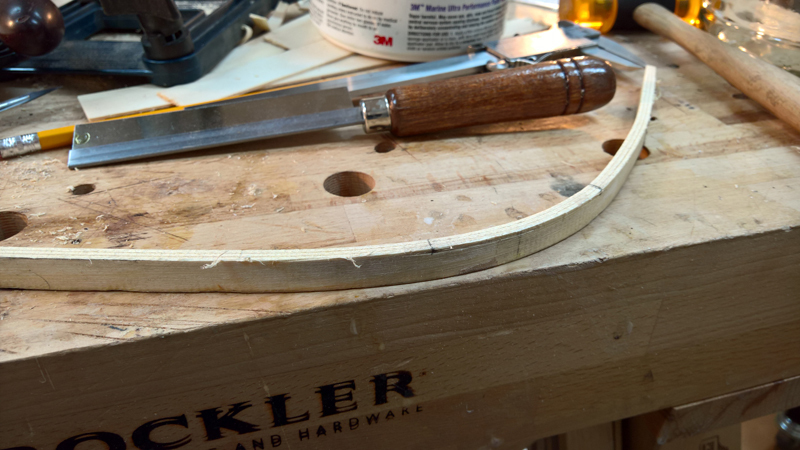 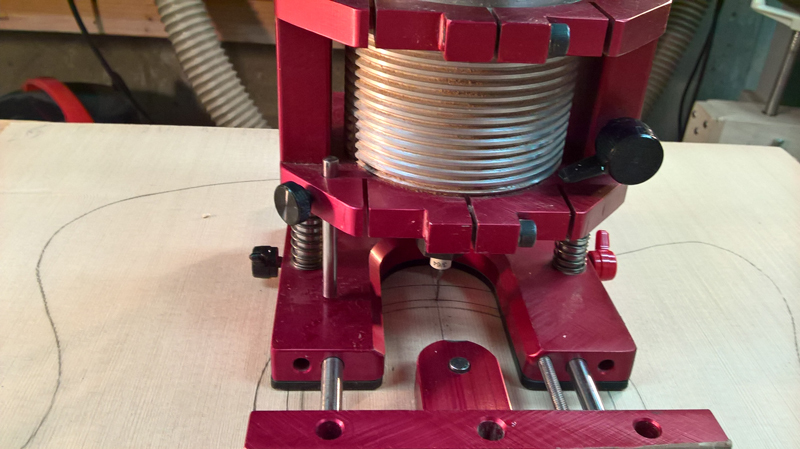 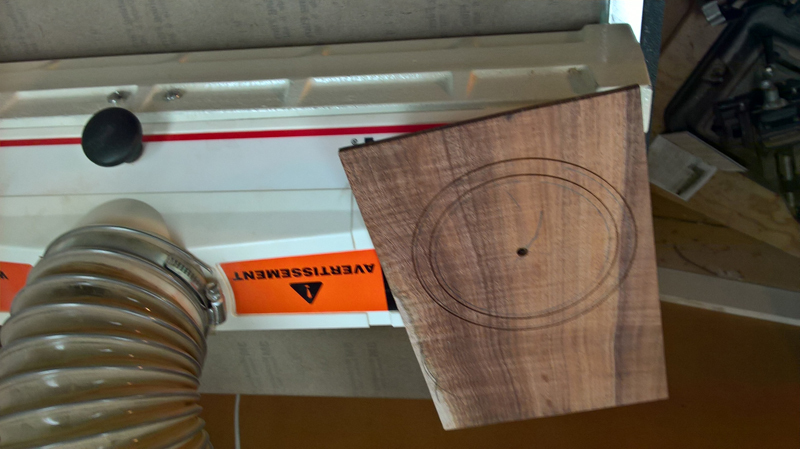 I route a channel for the inside purfling strip and without changing the router I route the same cut into my wood rosette blank. 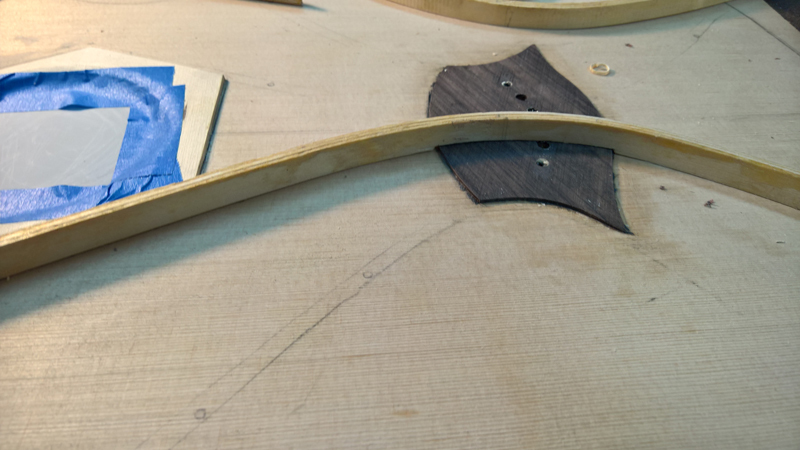 I then do the same for the outside purfling line. 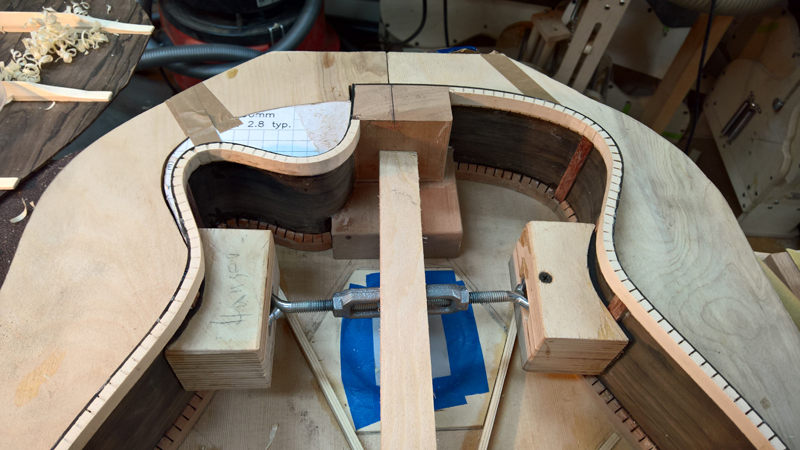 I then route out the waste between the two channels on the top. 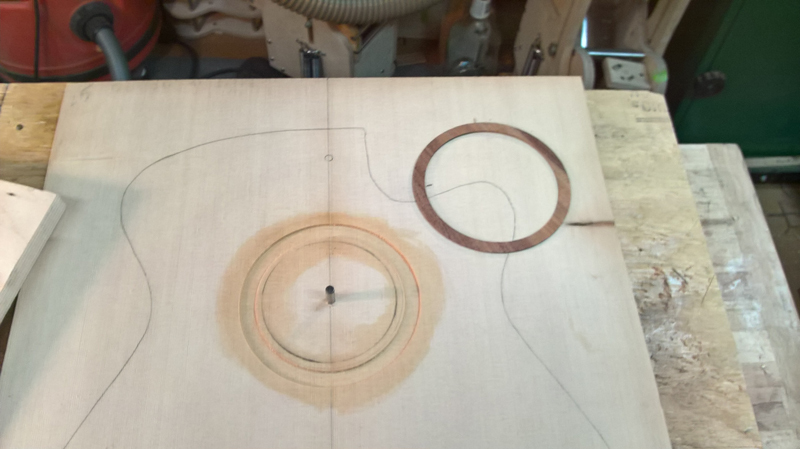 Now I have a ring routed perfectly for the ring and the purflings. 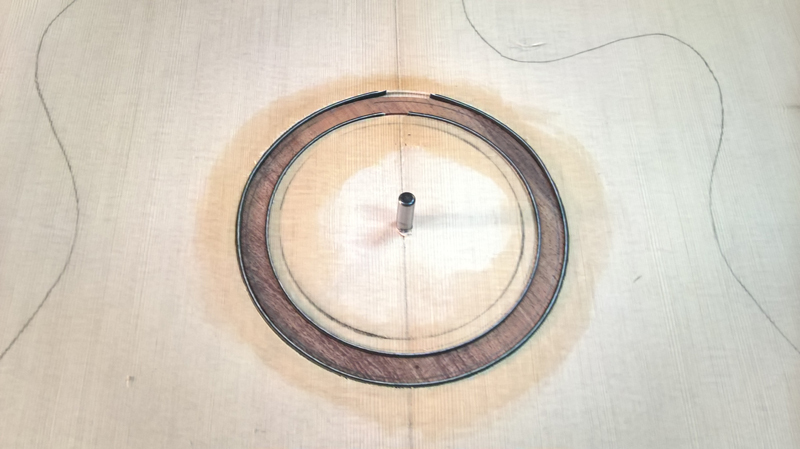 I run the rosette wood blank upside down through my belt sanded to the ring drops out. 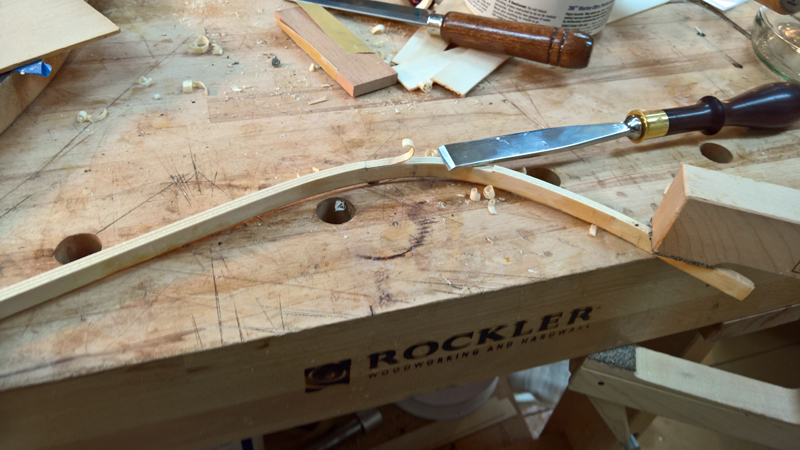 Now I have a ring the exact thickness for the channel I routed in the top. 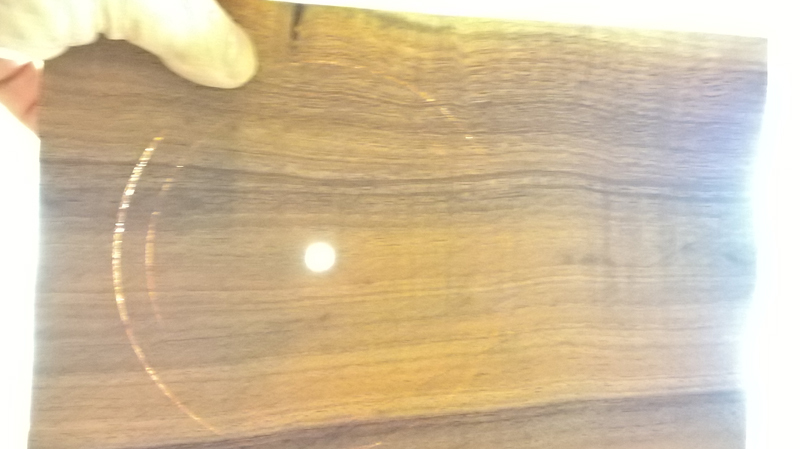 Here are some pictures to make it clear. 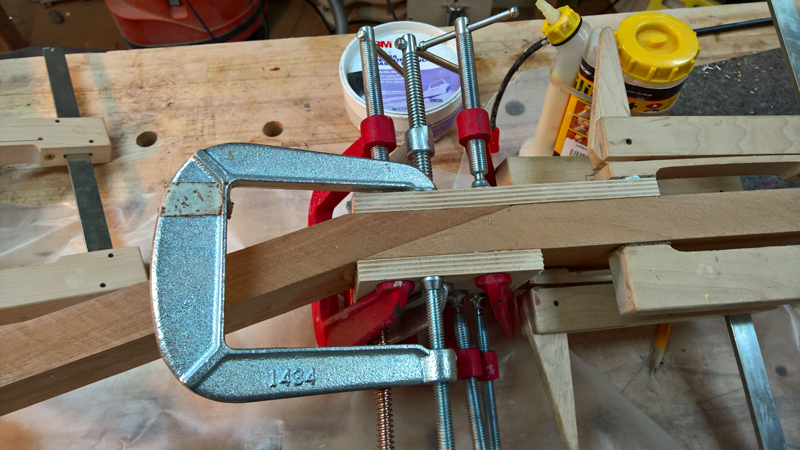 I learned this Kevin on this forum. 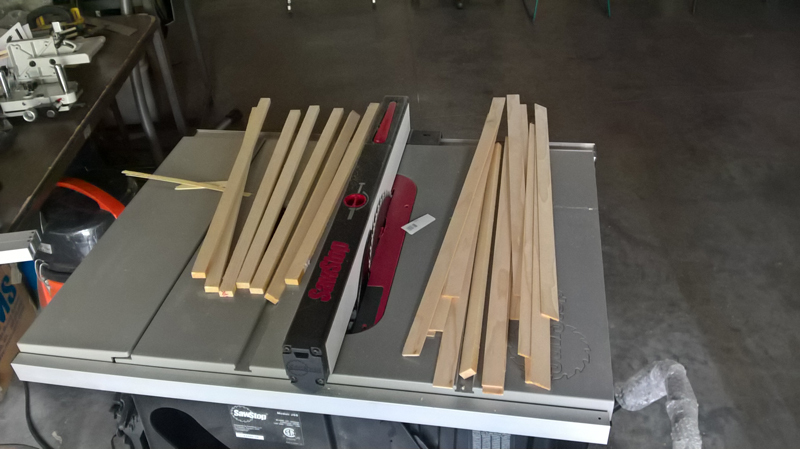 I do not use my table saw very often so when I pulled it out to rip the back braces and the lamination strips for the falcate braces I made a bunch of them. 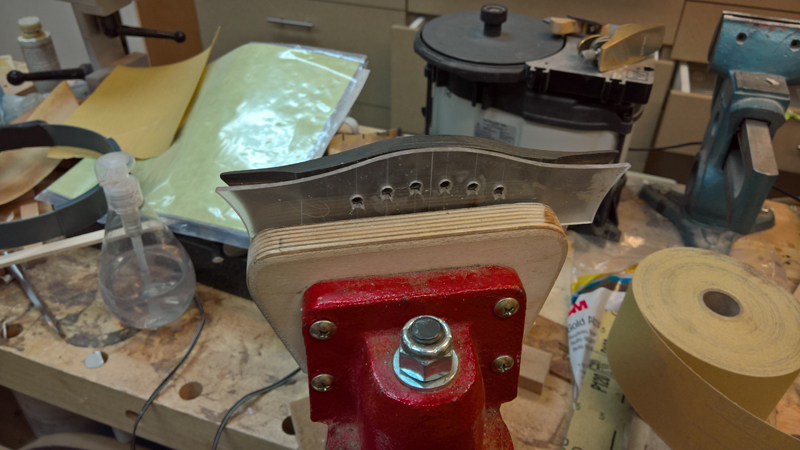 I have a nice blade on the saw and get close to a planed cut. 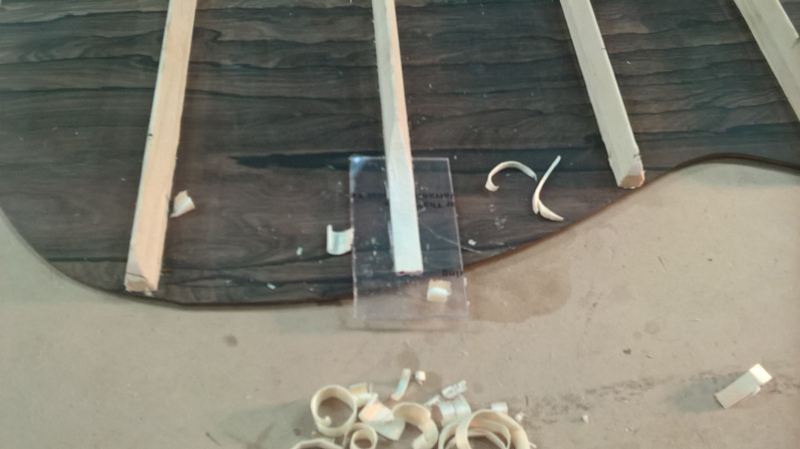 I cut them very close to the final size. 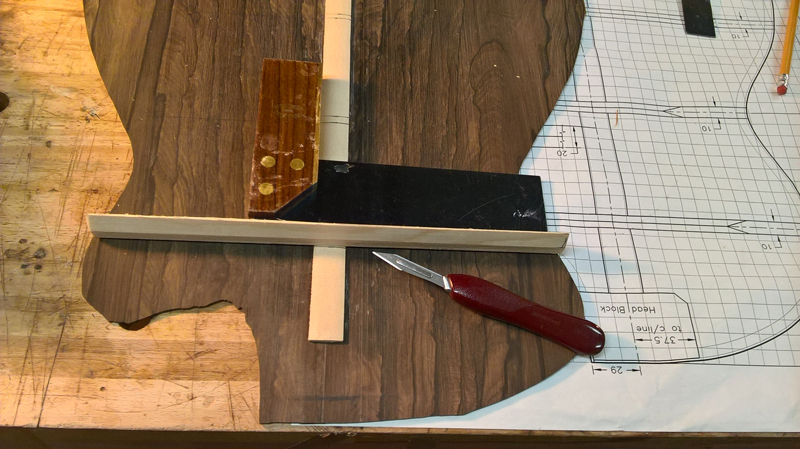 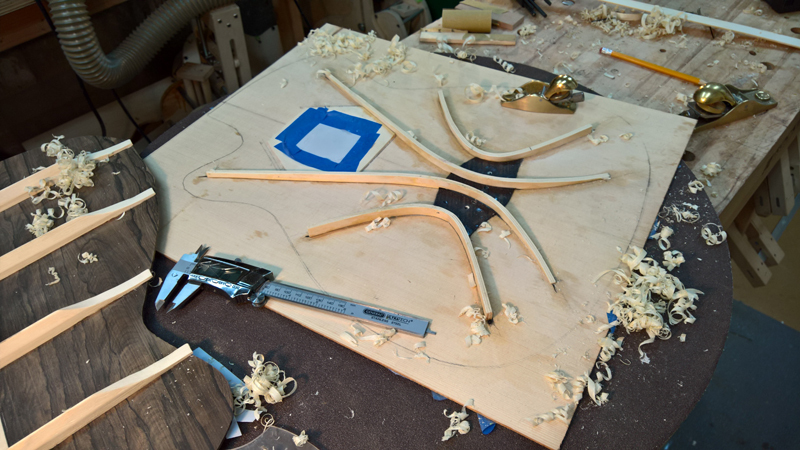 I laid out the back braces and use a square and the brace as a template to first score and then chisel out the rebates for the braces. 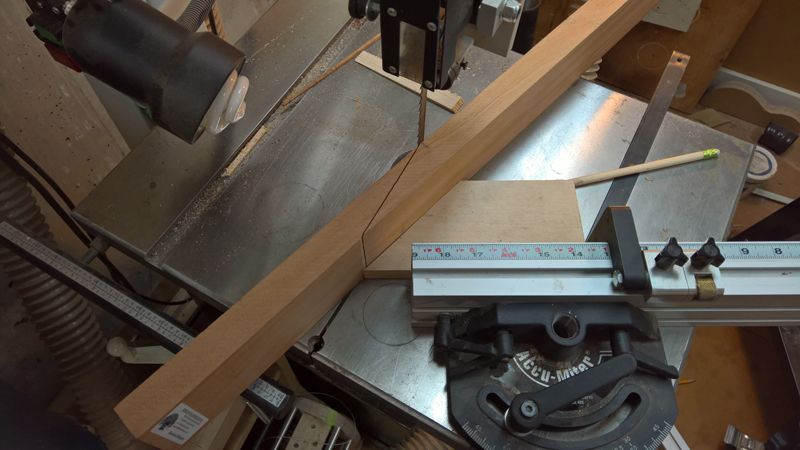 I mark out the bottom radius (15'), plane them close and then use this LMI jig to finish the radius on the back braces. 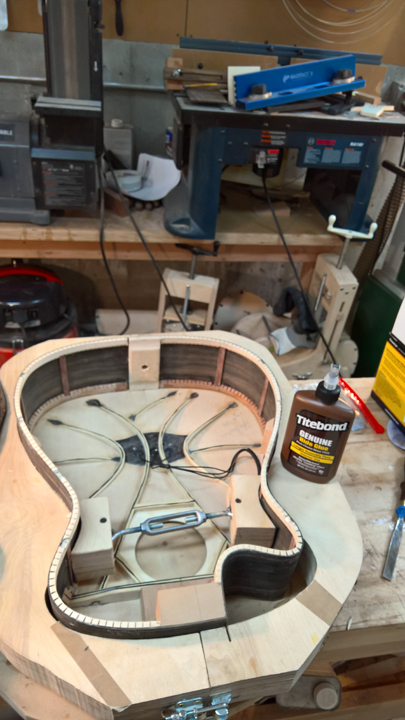 I used my vacuum box to glue the braces on the back. 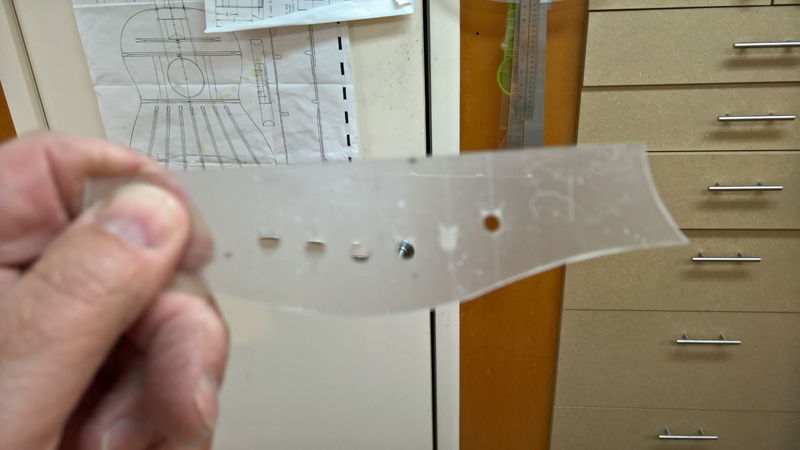 I finally made (it took all of thirty seconds) a small template to get the tails of the braces the correct thickness. 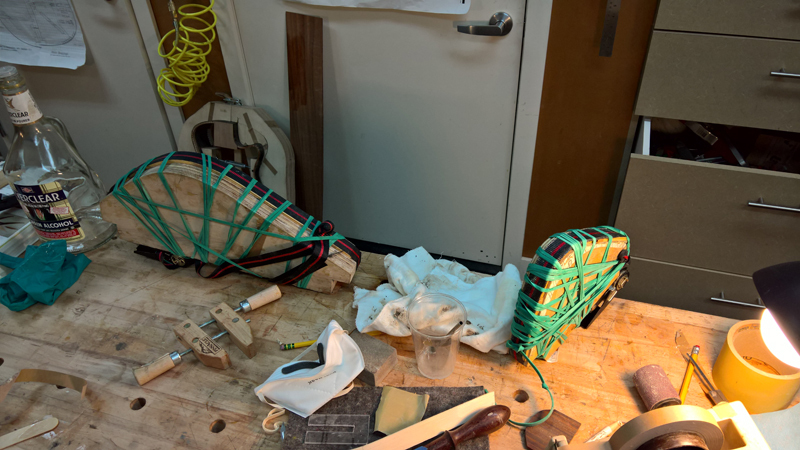 Given how quickly I made it and the consistency of the brace ends, I felt bad I have not made it before. 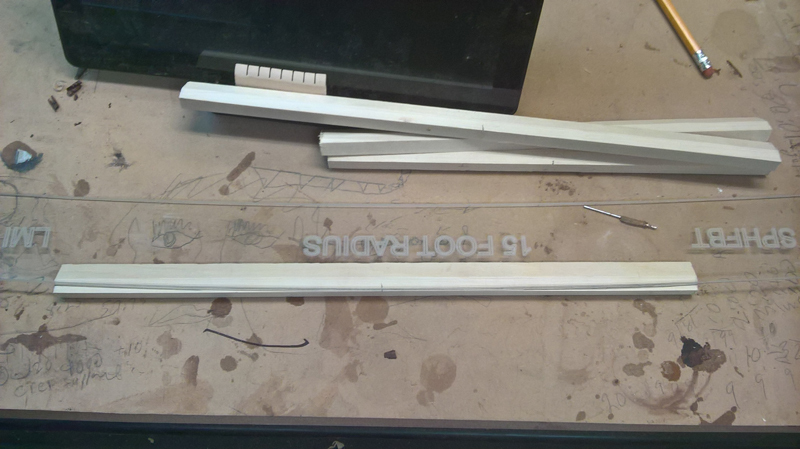 I just cut a slot into 1/8 plexiglass. 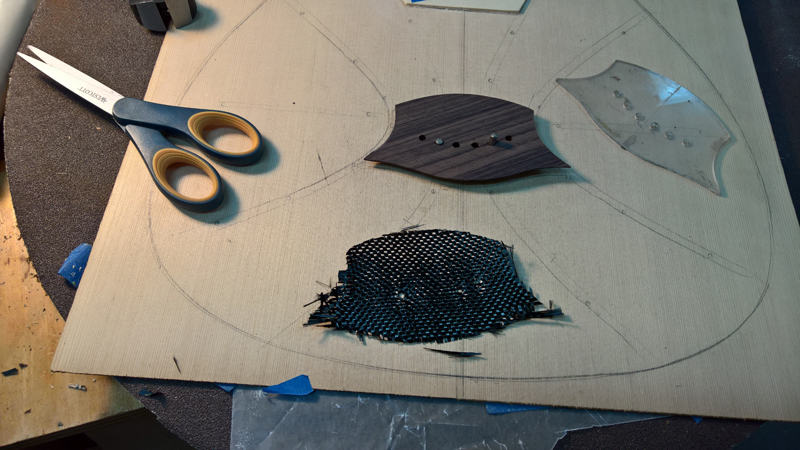 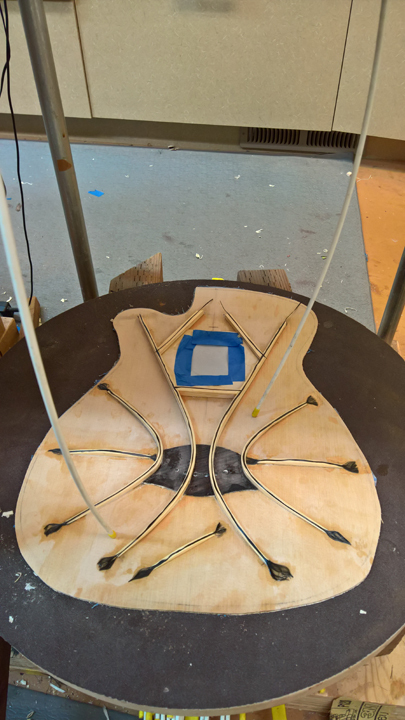 I laid out the braces, glued on the sound doubling patch and them routed out the sound hole. 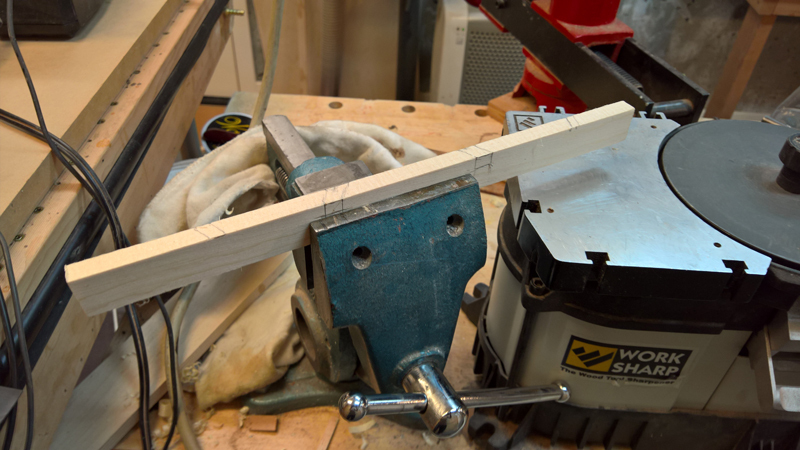 I stop routing when I still have a bit of wood left and tap out the waste. 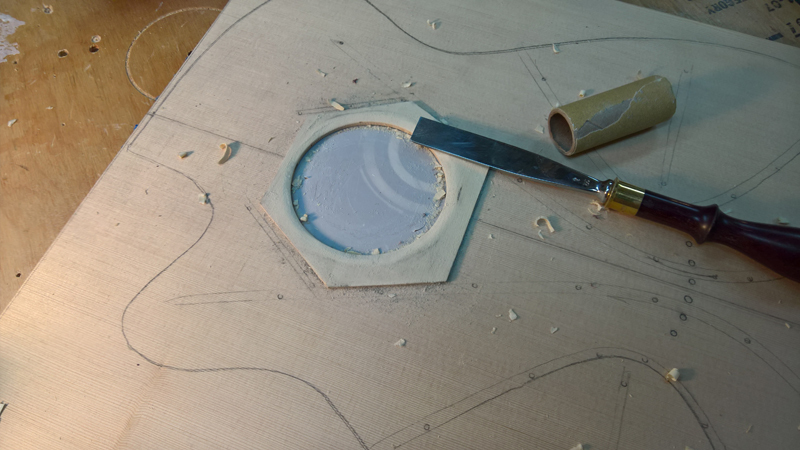 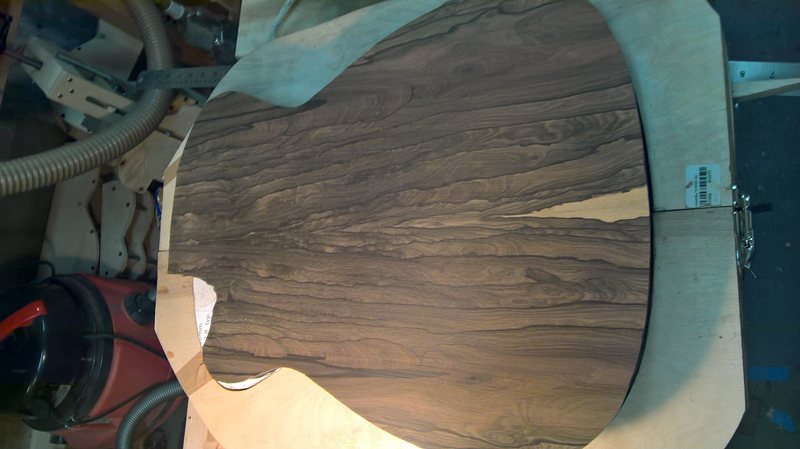 I chiseled out a bevel on the sound hole patch to clean up the look. 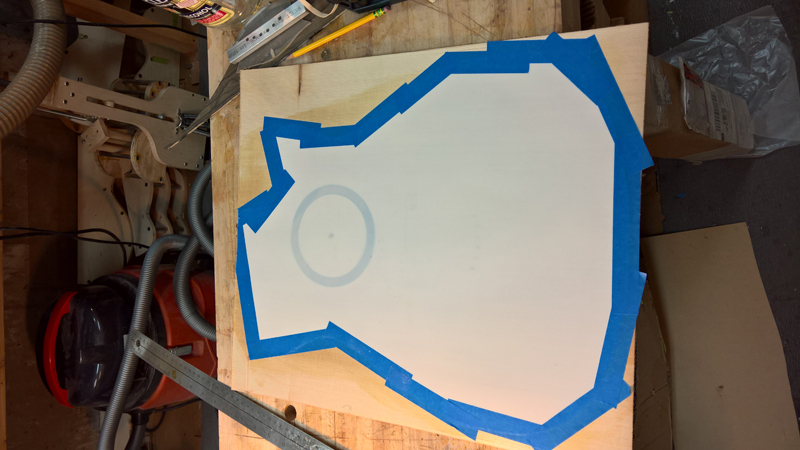 Also I decided to cut out a mylar template to protect the top before I started working with it. 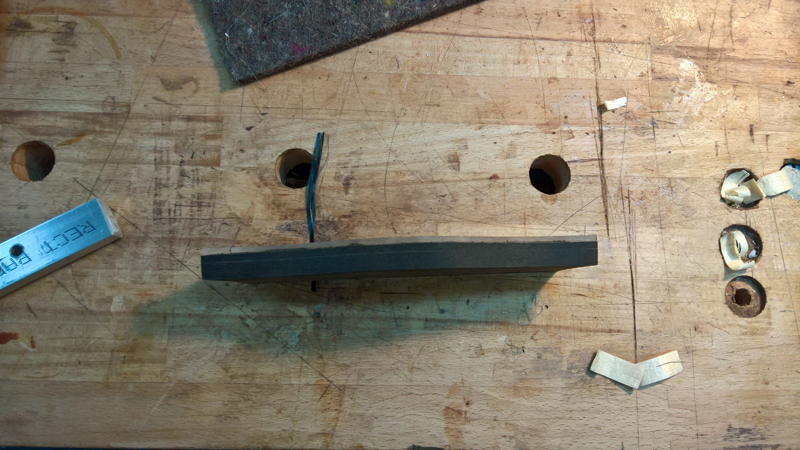 I need to locate and drill the bridge pin holes very early. 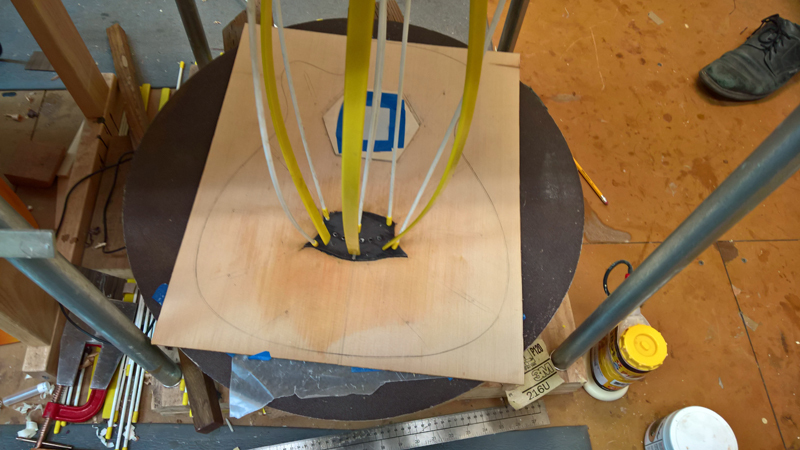 The main falcate braces need to go between braces pins on a steel string guitar with a pinned bridge. 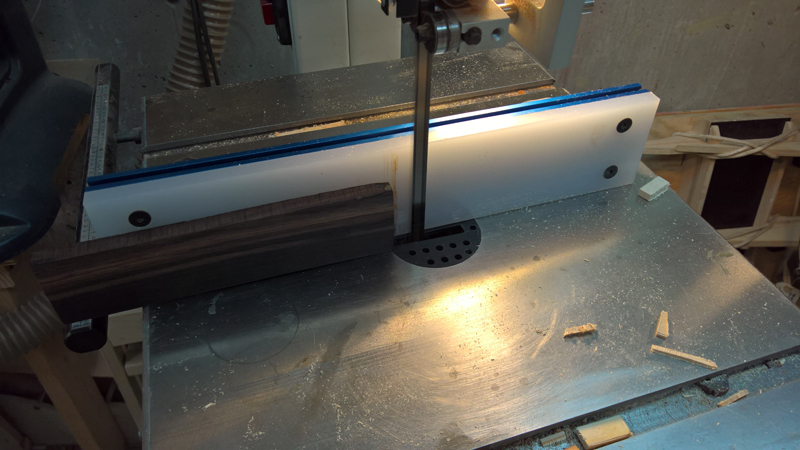 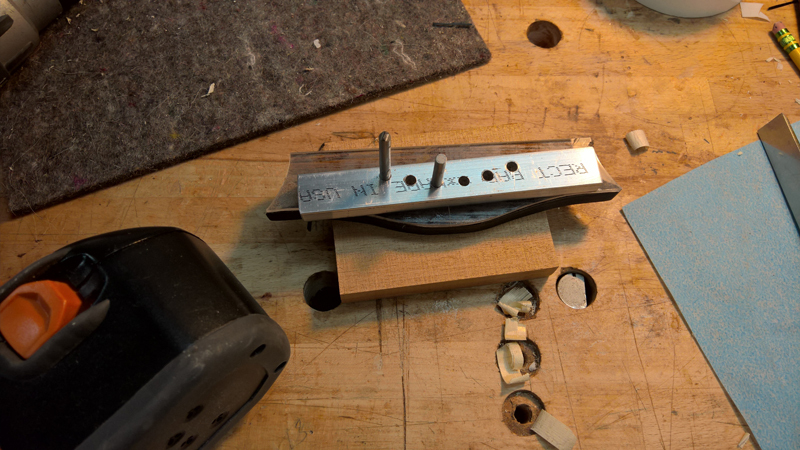 I also bought a hole stack of aluminium bars last years, so I pulled one out and made a bridge pin drilling template using my existing bridge pad template. 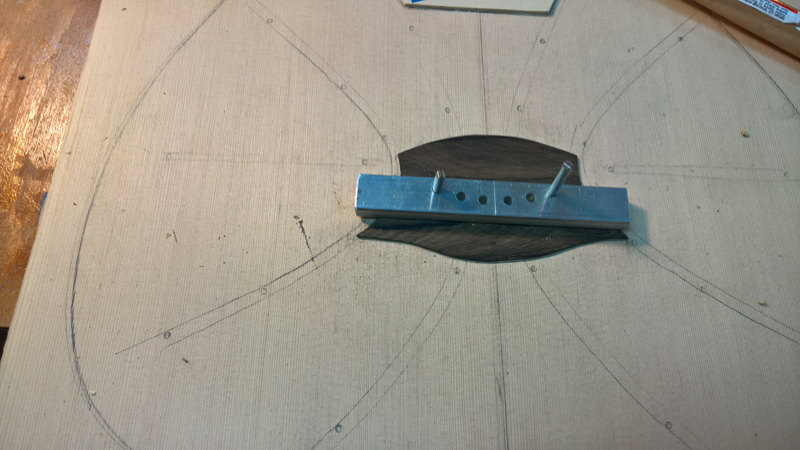 After some very careful alignment, I drilled one hole and pinned the top, bridge plate and hole template, I checked and rechecked the alignment and drilled a second hole and add a second pin. 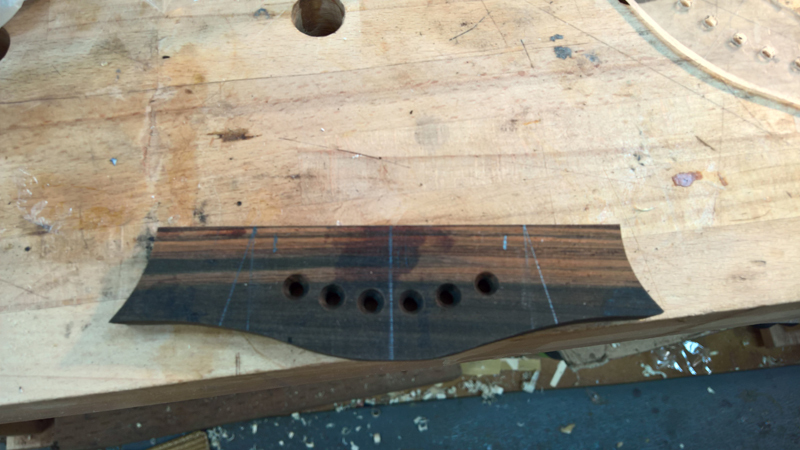 With the two pins I drilled the remaining four holes. 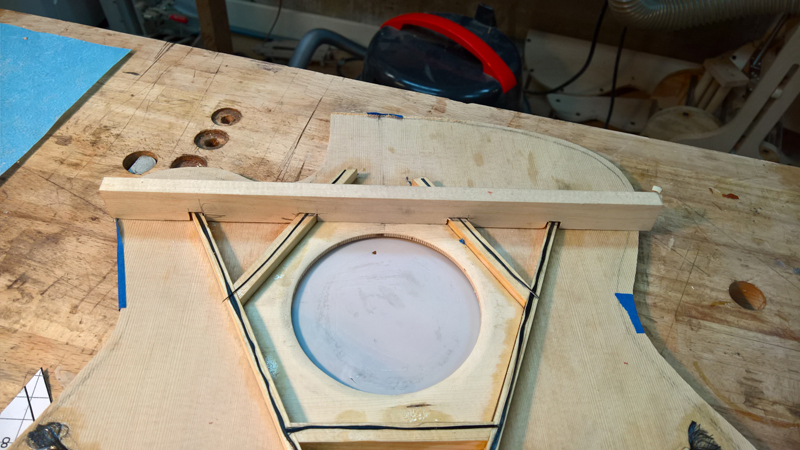 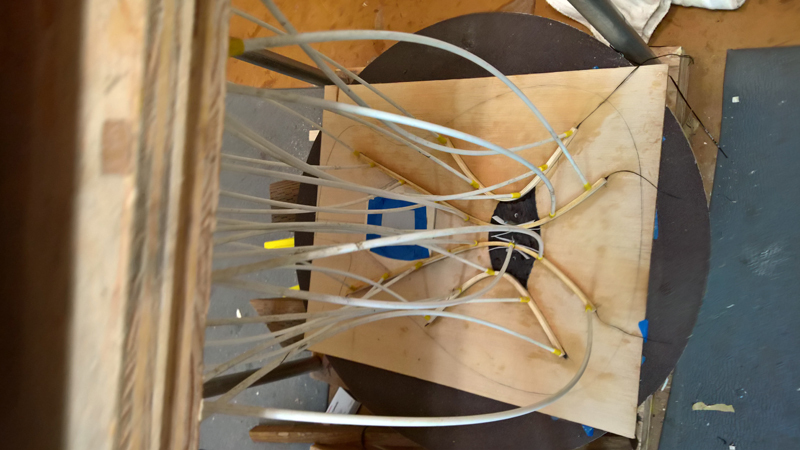 My radius board has the inside set of 4 holes so that I can work with the top pinned while epoxying the bridge plate and ultimately the braces. 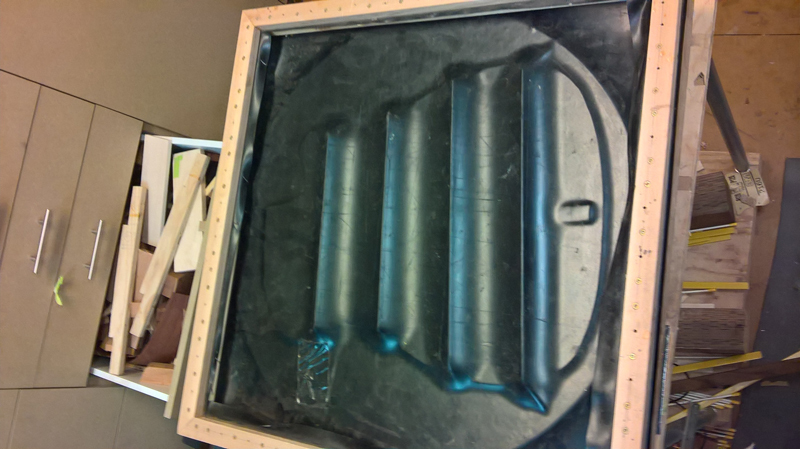 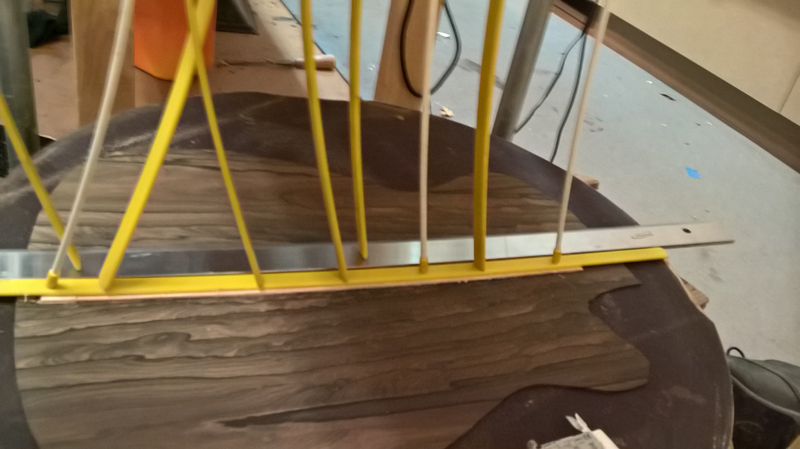 The bridge plate is epoxied on a cut out piece of carbon fiber fabric. 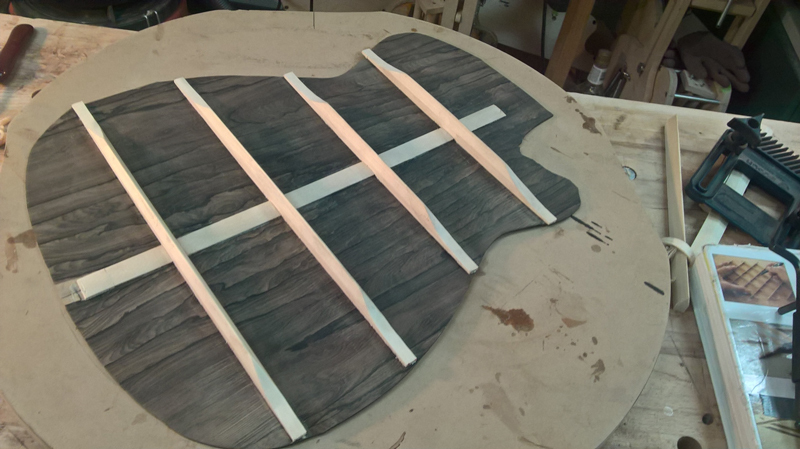 I will use my template as the gluing caul. 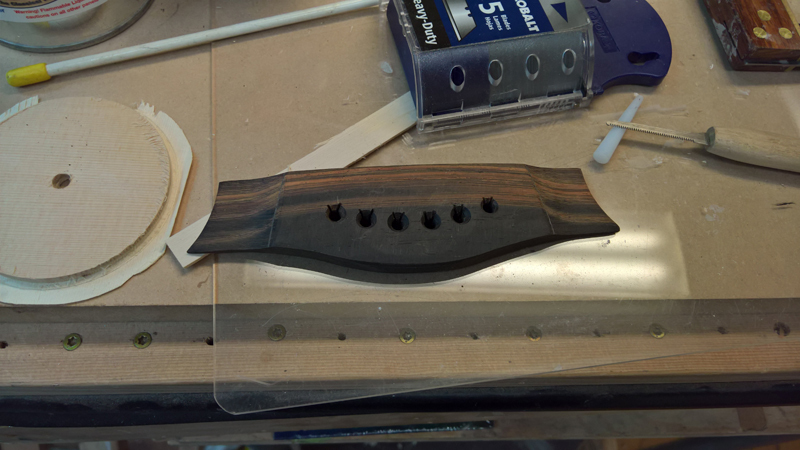 I mixed up some epoxy and put it all together. 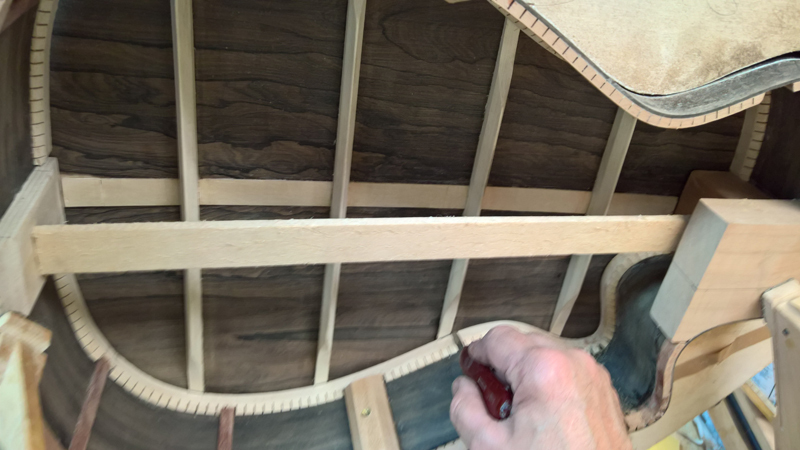 Finally I ripped, fitted and epoxied the falcate braces to the top. 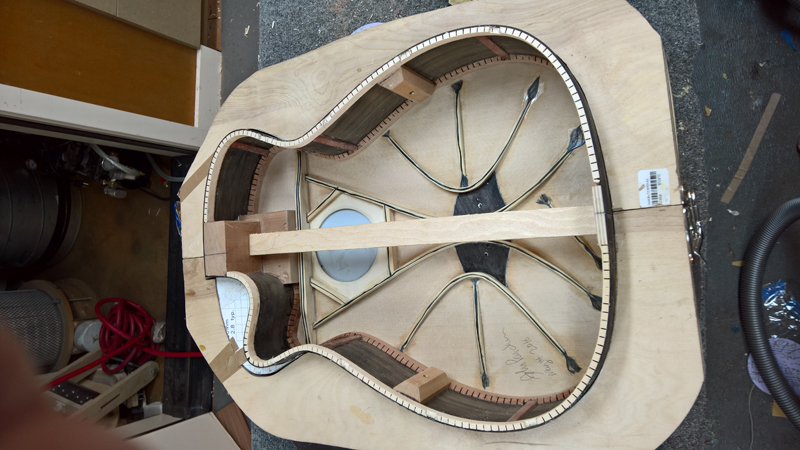 Note in the next picture the falcate braces are expoxied on top of a 3k 5.7 oz carbon fiber tow.. Also note the teflon strips used to properly space the falcate braces between the bridge pin holes. 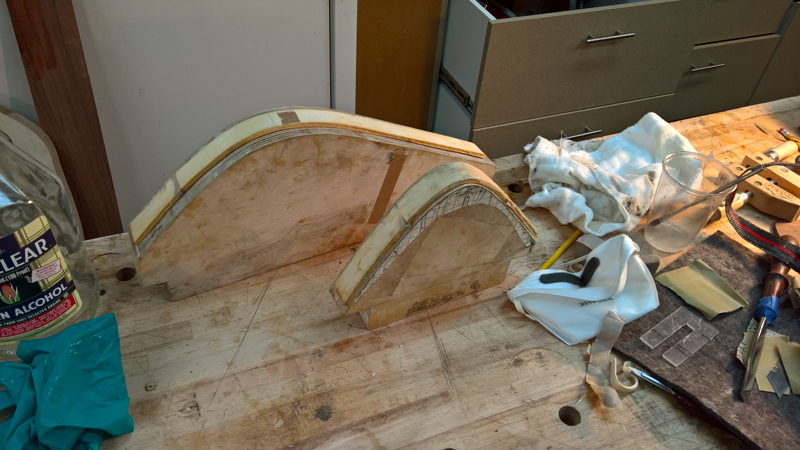 After the epoxy cured on the transverse I shaped them to there final dimensions. 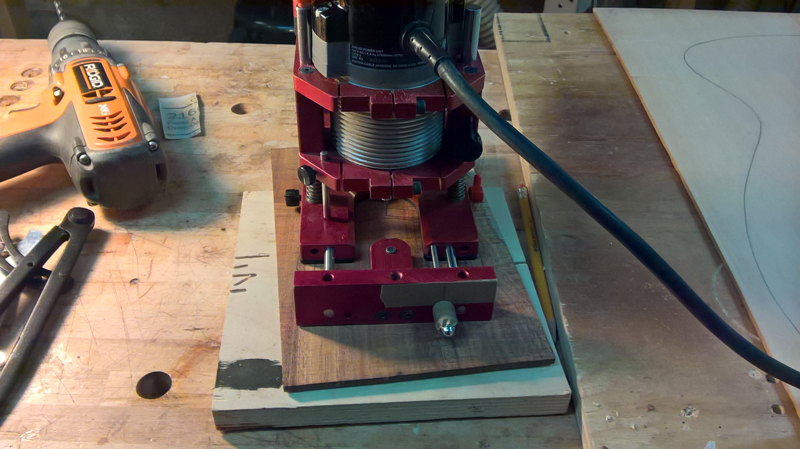 IN the first post I was deciding between 10 and 11 mm based on a load analysis. 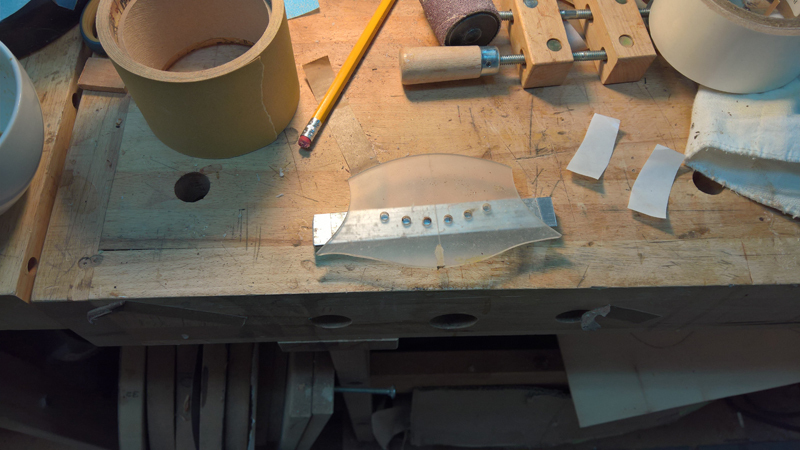 I ended up about 10.6 mm as the braces crossed the bridge pad. 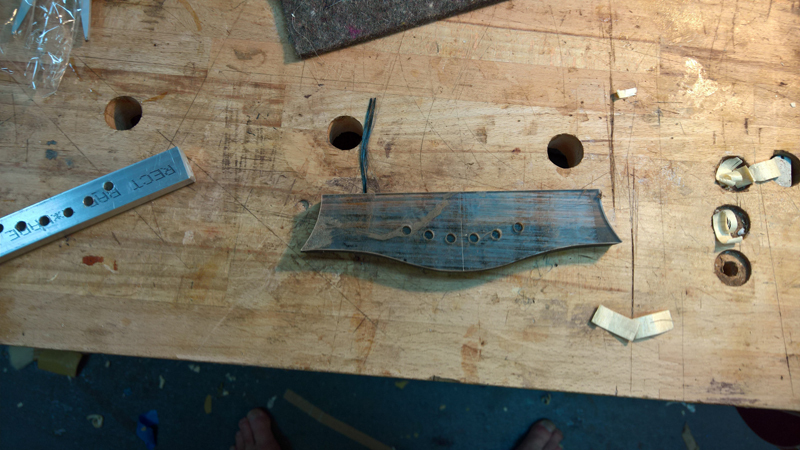 I took the secondary braces down to 8 mm. 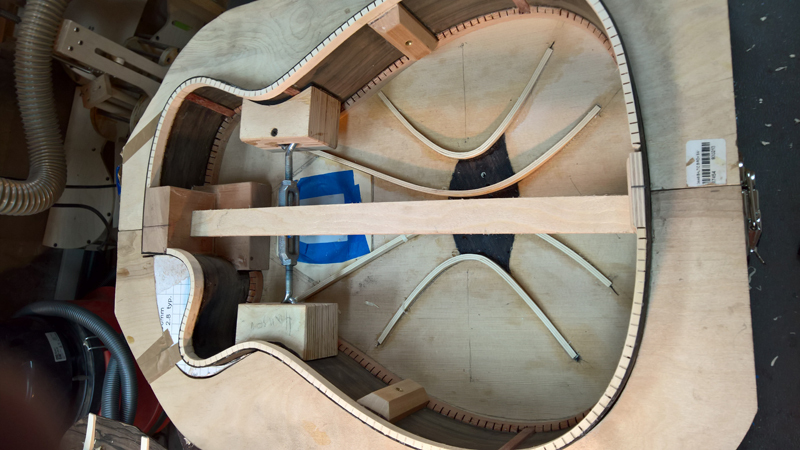 The extra load of the 12 strings is really in the main falcate braces. 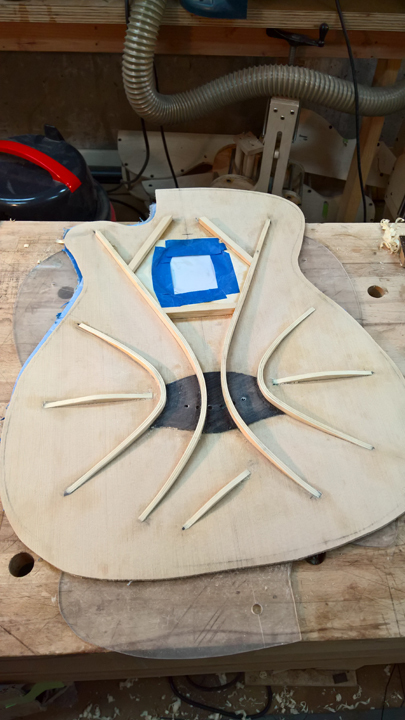 Given that the bridge is basically placed already, with the bridge pin holes drilled, I took the time to place the body with the rims and make sure while properly placed I will have 10 mm between the bridge patch and the neck block extension for the transverse brace. 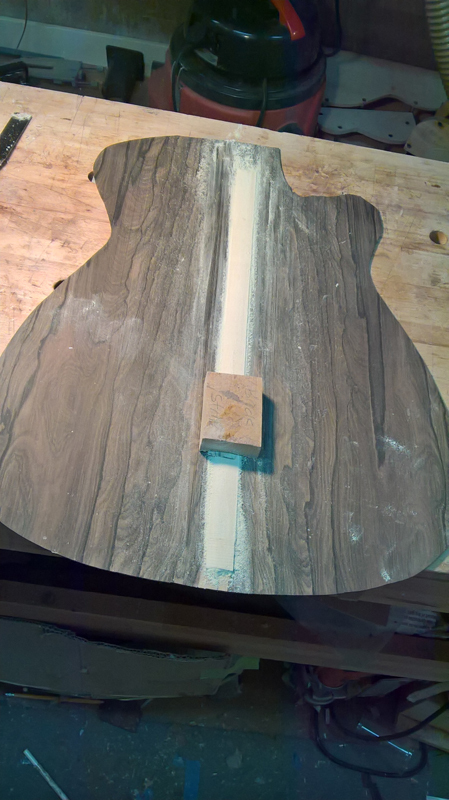 Now I am waiting for the epoxy to cure on the top application of CF. 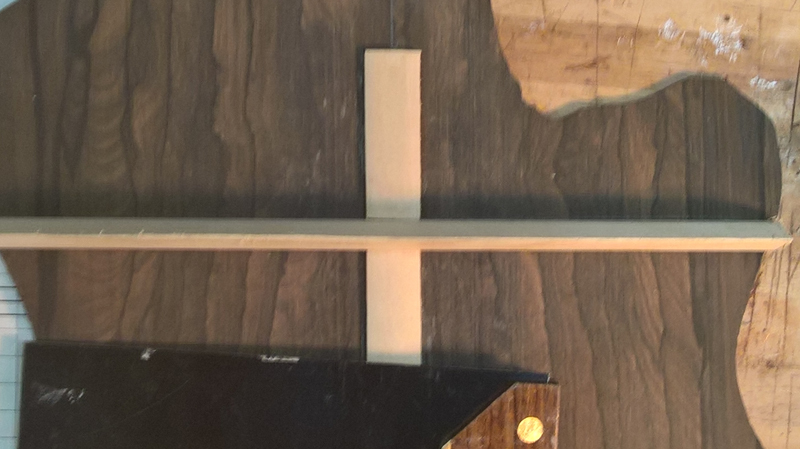 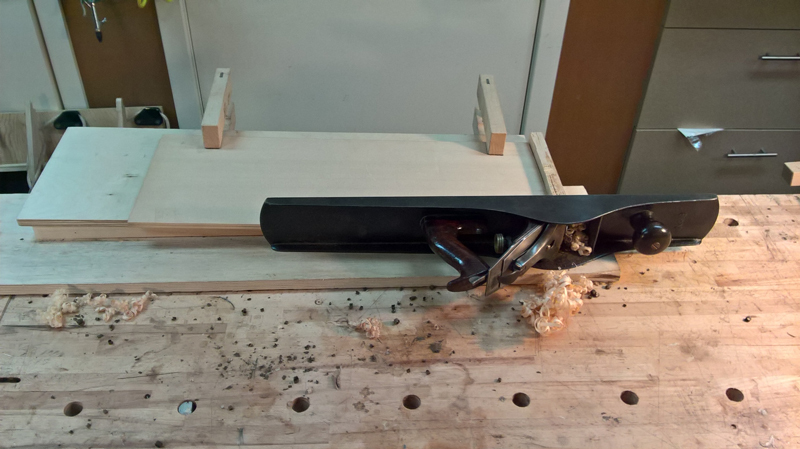 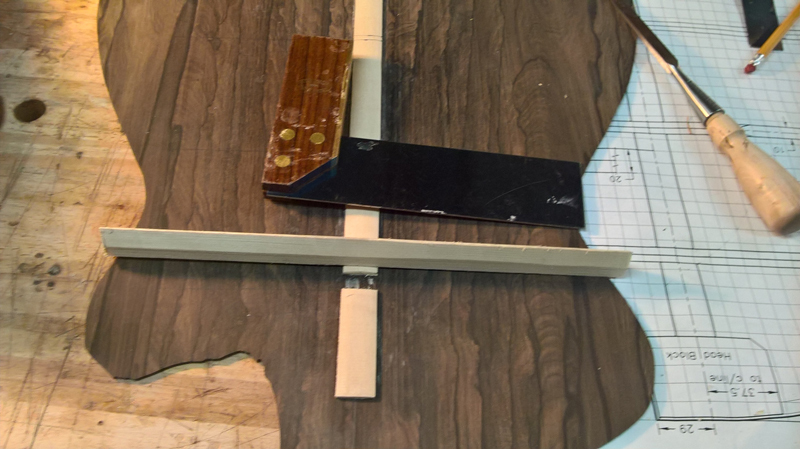 Sorry I been slow to post and this really should be about four posts I finished all of the bracing and closed the box (of course forgetting to drill the hole for the truss rod in the transverse brace.) 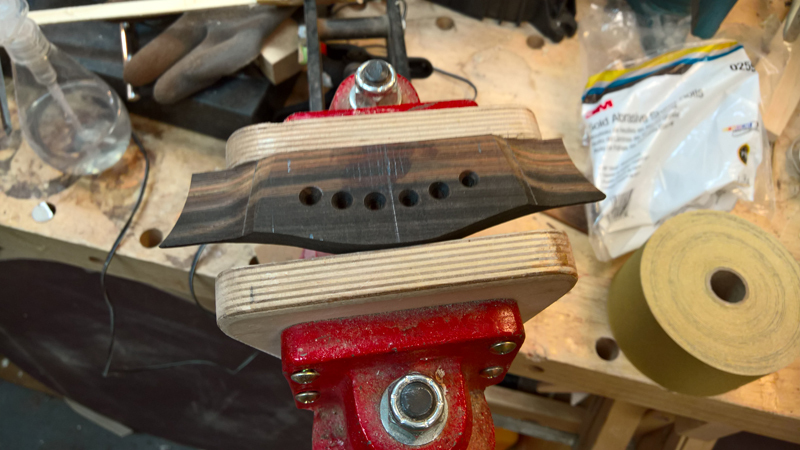 I also started the neck and made a bridge that I will use if I go with two holes per bridge pin. 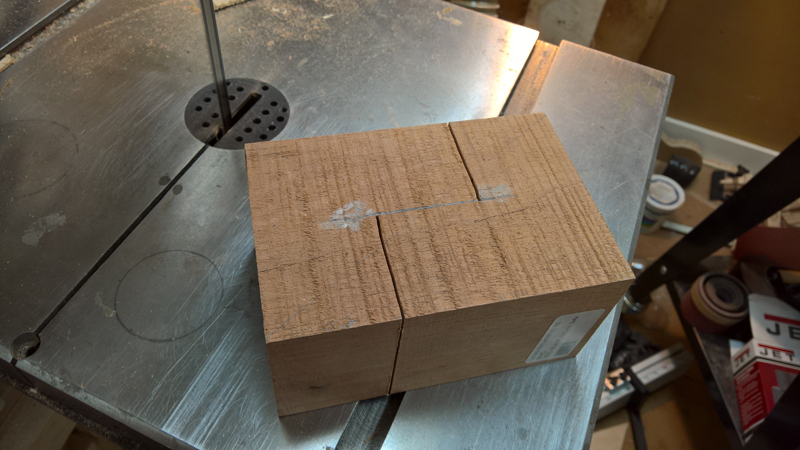 Here are the steps I went through before I closed the box. 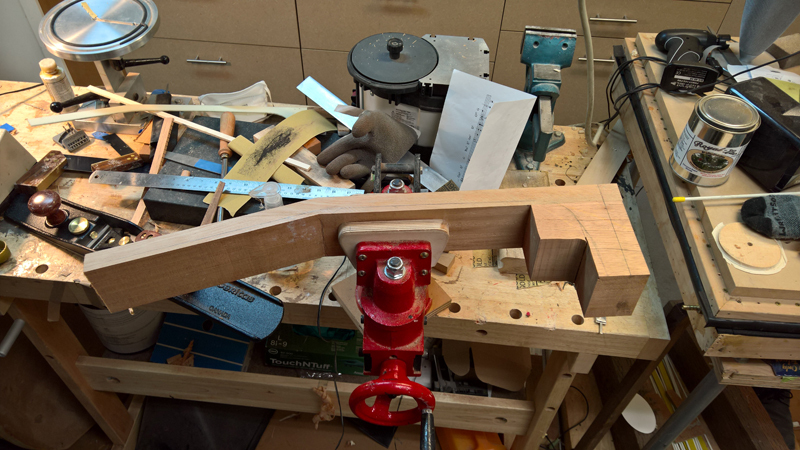 Not shown I put a bit of a radius on the transverse brace. 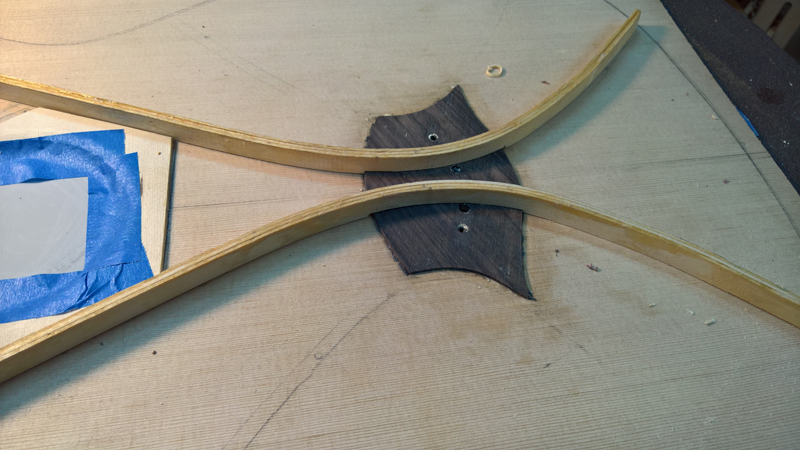 I left the center 3" or so flat, also I marked where the braces are let into transverse brace. 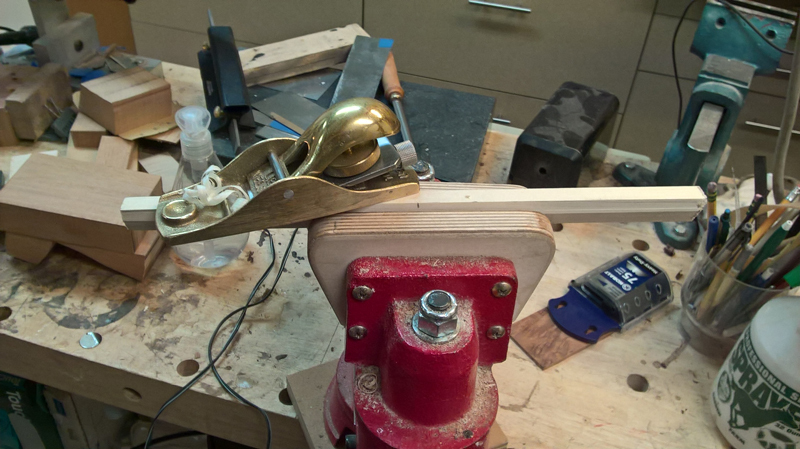 I use the jaws of the parrot vice as a depth stop and use a razor saw followed by chiseling out the waste. 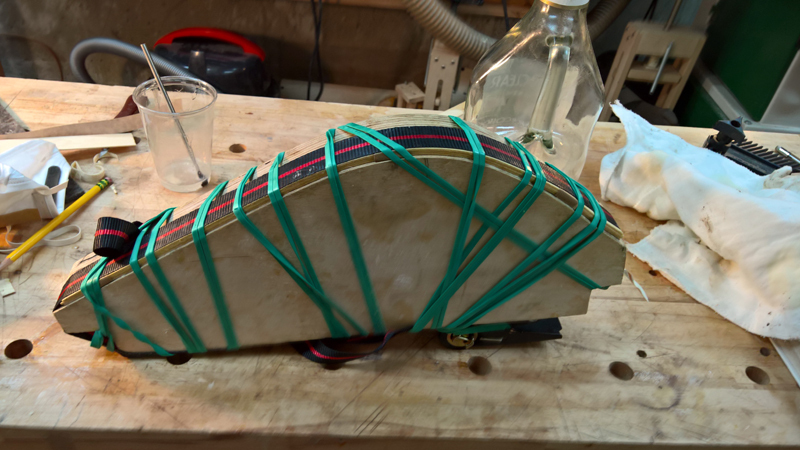 I do not have pictures but I epoxied the transverse brace to the top with a CF strip and shaped the brace. 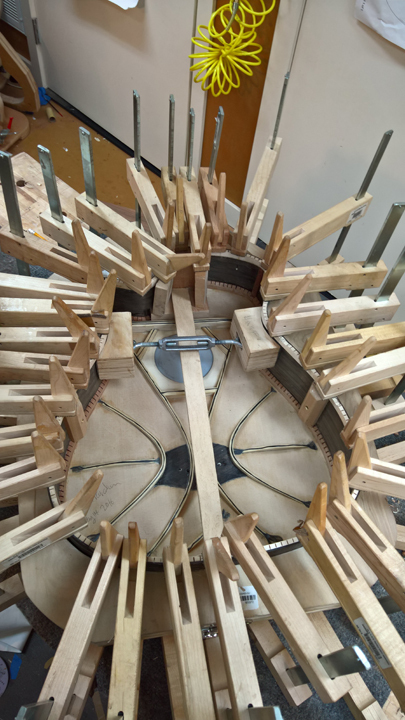 I prepared the rims for the top and back marking with a scalple and routing with a pencil mill grinder. 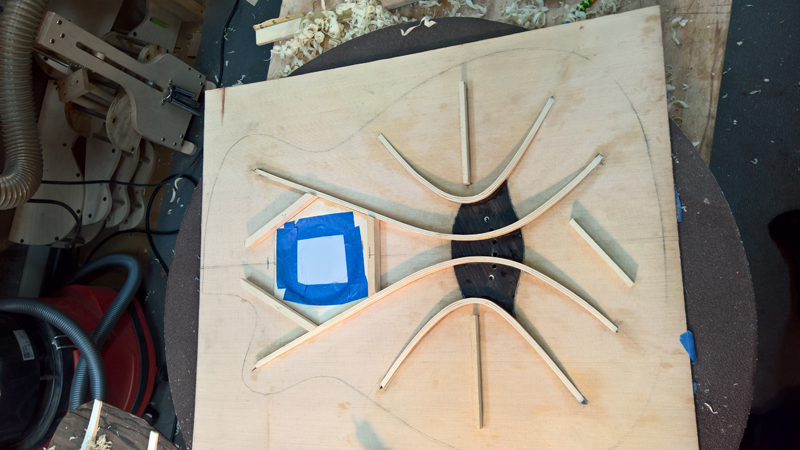 Outside of my normal process I glued the top first. 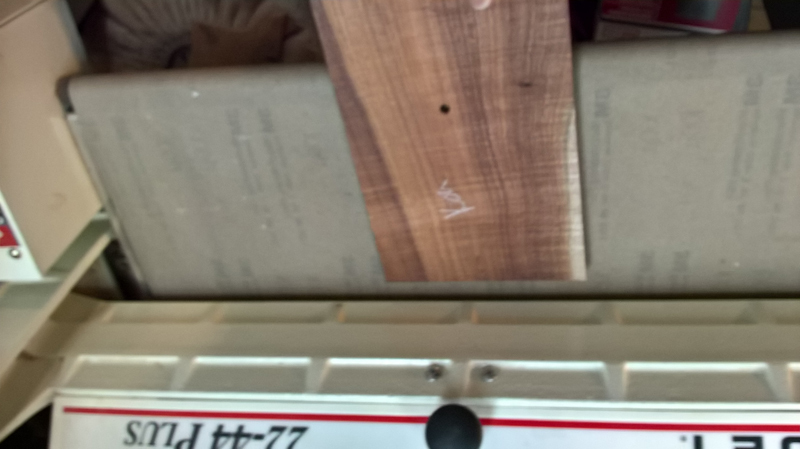 I was waiting for a K$K pure pickup. 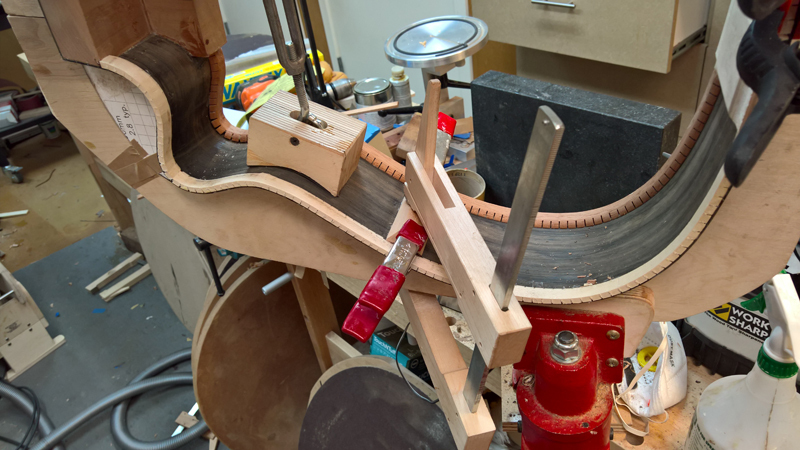 Also before gluing the top to the rims I checked the angle of the top under the fret board extension to make sure I had the 2.5 mm gap at the saddle I was looking for. 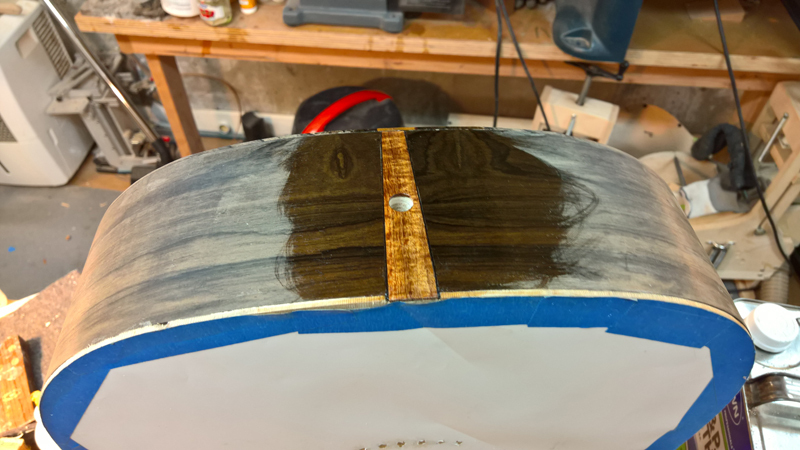 Before putting on the back I made an end wedge of Koa and installed it. 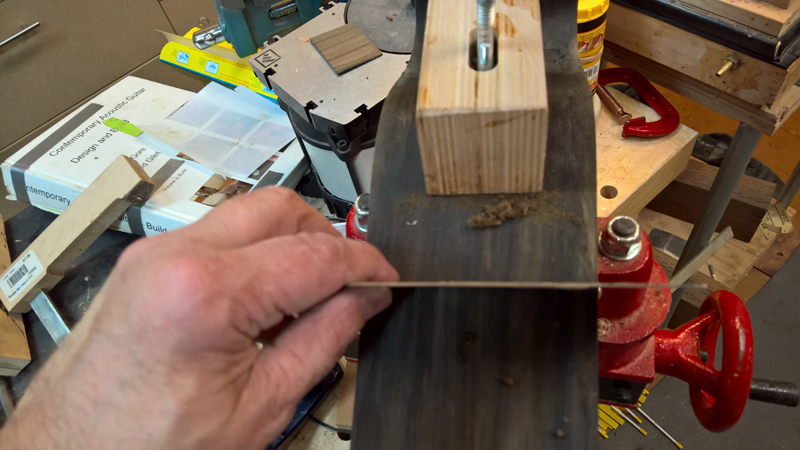 I decided to use a brand new, I check the date bottle of Tite bond hide glue to glue on the back. 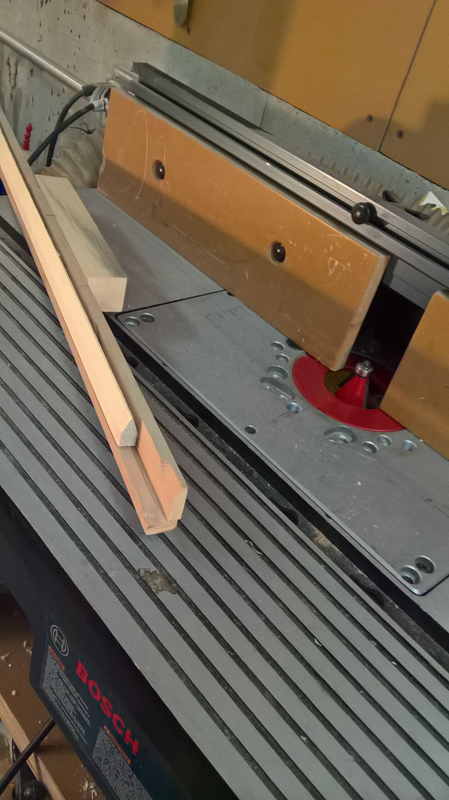 I sliced up a bridge blank into an 8 mm and a 3 mm strip. 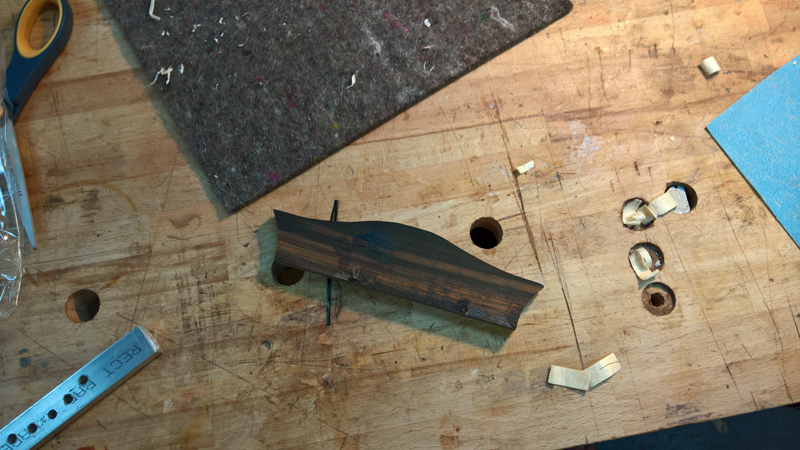 And laminated it back together with a sheet of CF weave. 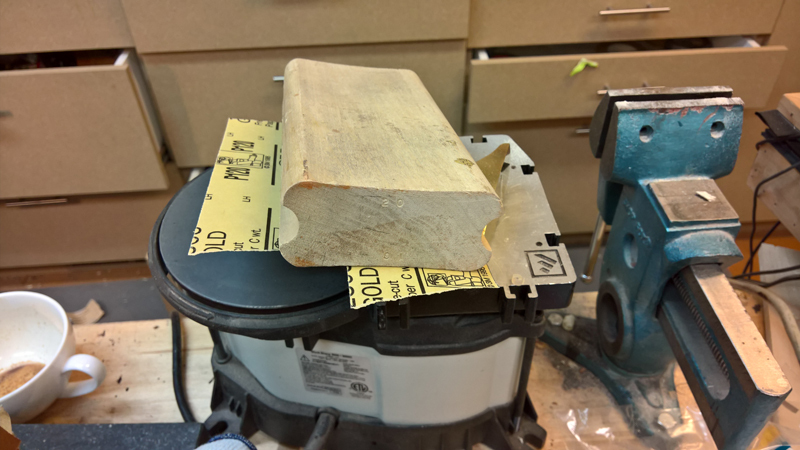 I have a template so I used the band saw and my belt sander to profile the bridge. 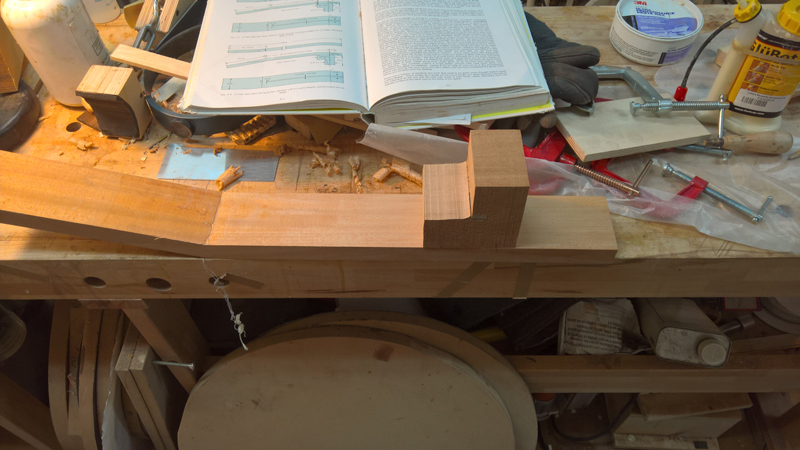 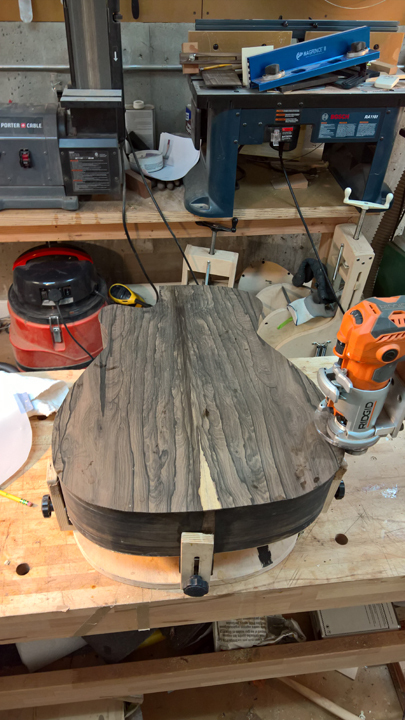 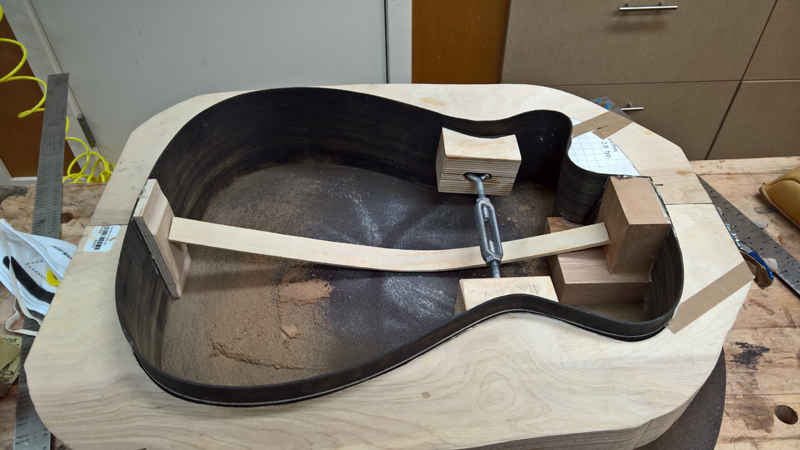 I used a drum sander in my luthiers friend to profile the wings I used a 16" sanding block to profile the top of the bridge. 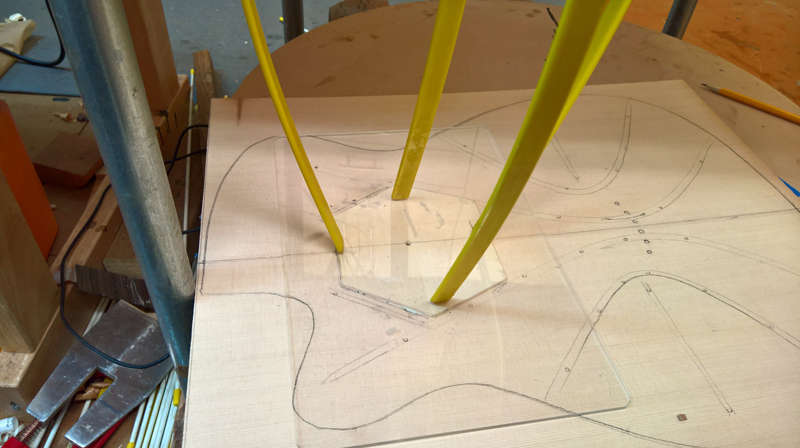 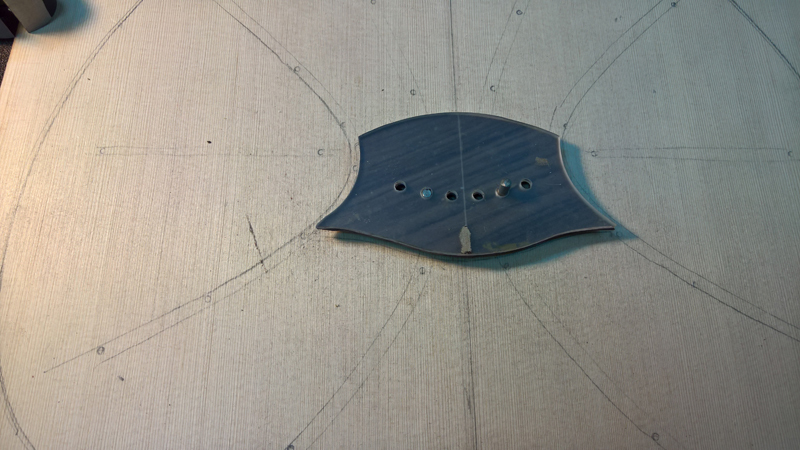 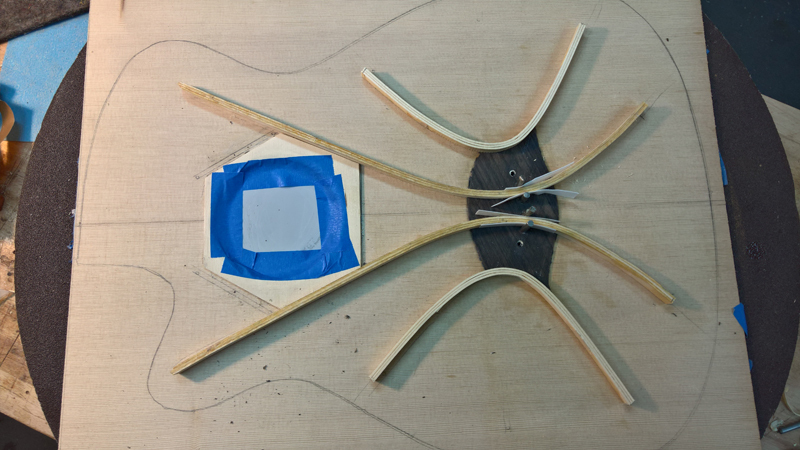 I modified my template to space the two string per pin and used the template to guide my cuts with a thin saw. 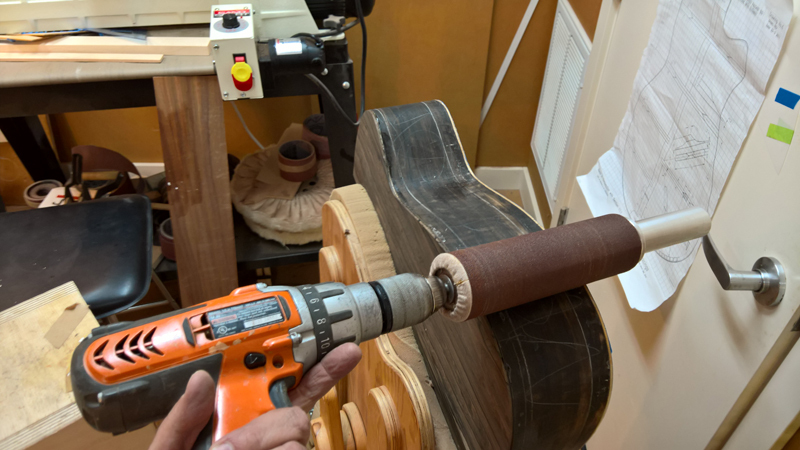 I think I am close enough to make them work. 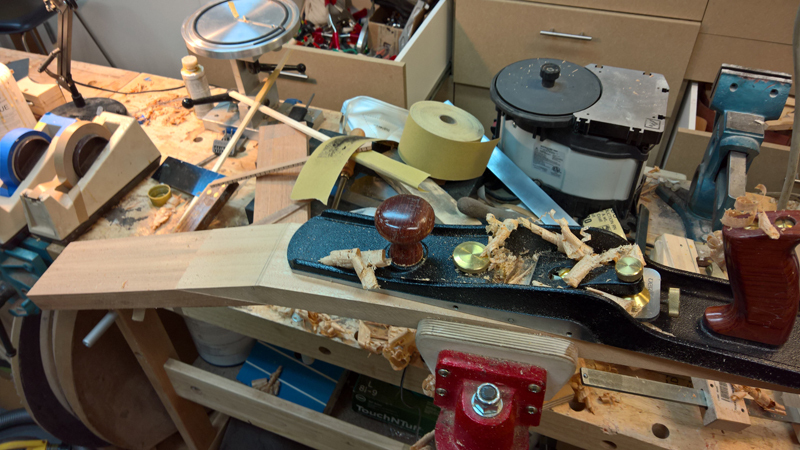 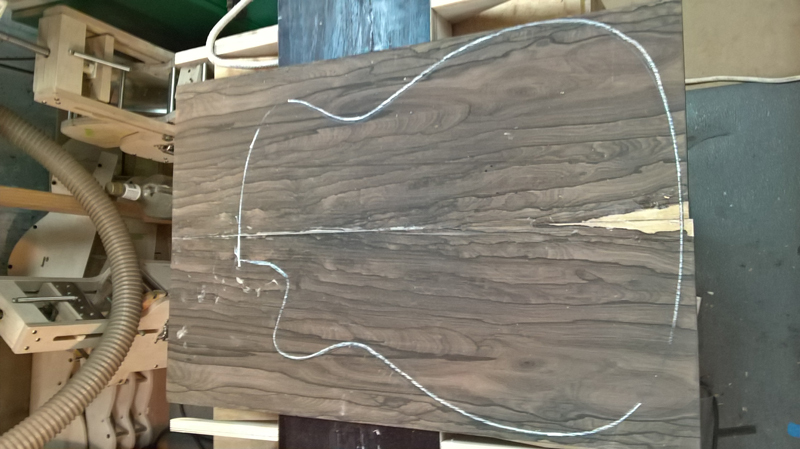 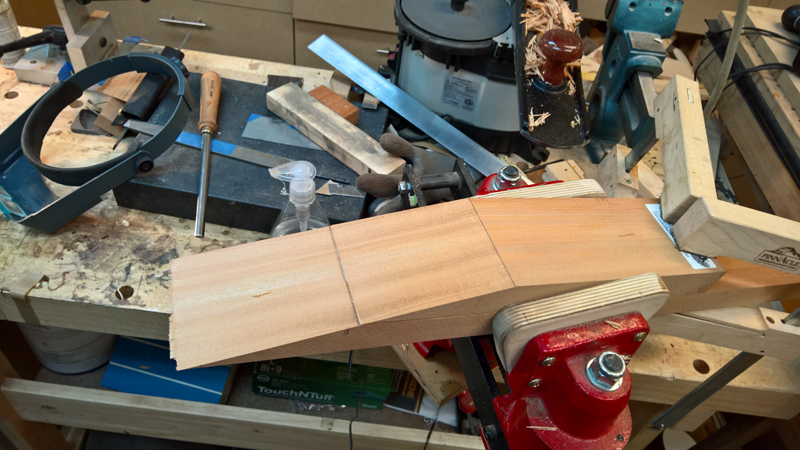 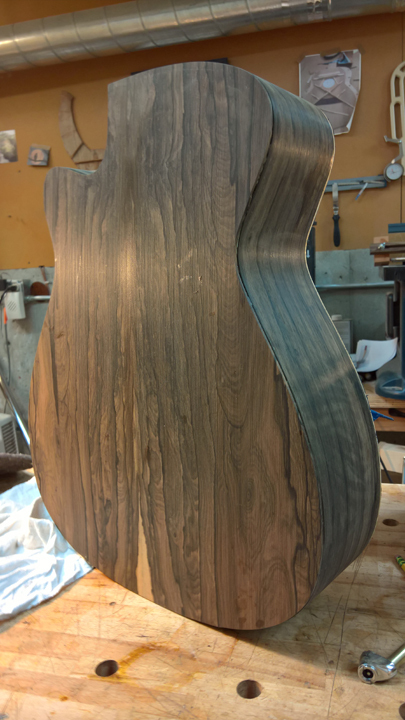 As mentioned I also started to make a neck.